Billy Johnson and Scott Maxwell return to the IMSA Continental Tire Sports Car Challenge series for the 2016 season piloting the No.15 Multimatic Motorsports Ford Performance Shelby GT350R-C.
​This marks the duos second year as co-drivers having garnered 3 pole positions and a victory last year at Lime Rock Park for a historic 1-2 finish for the Shelby GT350R-C.
"It's an honor to be driving with Scott again this year" said Johnson. "His accomplishments speaks for themselves and I have learned a lot from him this past year. We have great chemistry both on and off the track, which is really important for moving with the team toward the same goal." The Multimatic, Ford Performance team had only a week to build a brand new No. 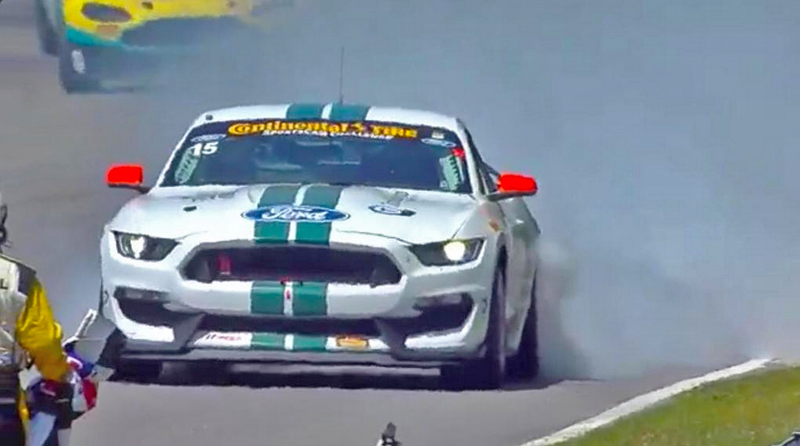 15 Shelby GT350R-C from the ground-up after a backmarker caused Scott Maxwell to crash at Canadian Tire Motorsports Park and subsequently destroyed the car. After starting from the back of the pack due to electrical problems during qualifying, Scott Maxwell and Billy Johnson led a historic 1-2 finish for Ford and Multimatic as the duo brought the No. 15 Multimatic Ford Shelby GT350R-C home in first place following two hours of hard fought racing. Billy Johnson in the No. 15 Multimatic Ford Shelby GT350R-C crossed the line just over three seconds ahead of the sister No. 158 Multimatic Ford Shelby GT350R-C of Austin Cindric and Jade Buford. The win is the second consecutive IMSA race victory for the Multimatic Ford Shelby GT350R-C after Cindric and Buford combined to bring the car its breakthrough win at Canadian Tire Motorsport Park just two weeks ago. “It was a great day,” said Multimatic’s Technical Director Larry Holt. “To finish 1-2, I mean Jade (Buford) did a fantastic job. It’s a bit of a Cinderella story, coming from the back in a car that happened to be built from scratch in the last week and a half. And we are really racing, there is nothing that gets left out there. Those Nissans were coming for us. I can’t say enough, Billy is a star, and Scott (Maxwell) did an incredible job coming from the back like he had to do." In just three races, the Shelby GT350R-C has two poles and two wins. Both Multimatic cars have won with the new car showing the team’s versatility and talented drivers. 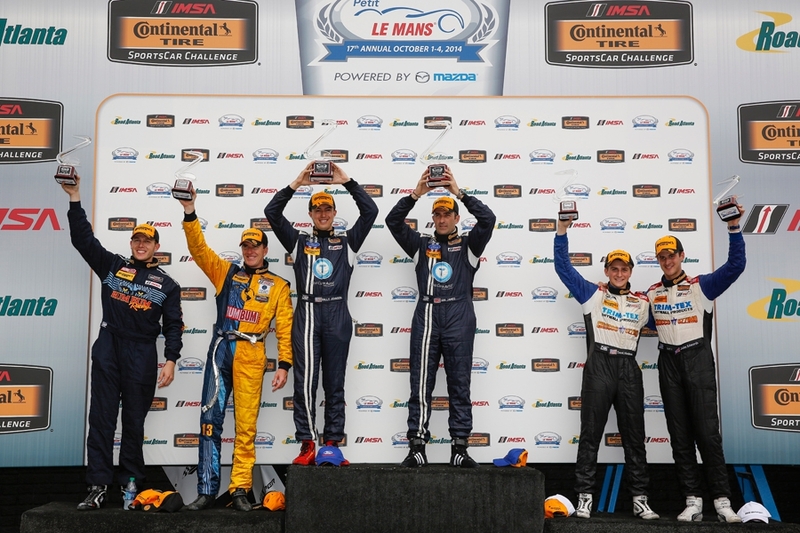 The win Saturday was Maxwell’s 10th Continental Tire Sportscar Challenge victory and the 17th for Johnson. ﻿While not having many opportunities to qualify during his career, Billy Johnson took the Pole at Canadian Tire Motorsports Park in the No. 15 Multimatic Motorsports Ford Performance Shelby GT350R-C setting a new track record with a blistering time of 1:26.461 which was over 0.7 seconds quicker than the No. 158 Shelby GT350R-C of teammate Jade Buford. ﻿﻿Billy Johnson drove a tremendous final stint of the race, charging back through the GS field to bring the No. 15 Multimatic Motorsports Mustang BOSS 302R home in second position in the third round of the Continental Tire SportsCar Challenge at Mazda Raceway Laguna Seca. Johnson pitted for fuel and fresh tires with about 40 minutes remaining in the 150-minute race and rejoined the field in eighth position before carving through the field and nearly taking the win. “Initially, I wasn’t quite sure how everything was shaping up strategy-wise, but Multimatic called a perfect strategy for the last pit stop and getting tires when we did,” explained Johnson. The strategy played out perfectly as the No. 15 pitted for new tires but the other GS cars opted to stay out and retain their track position. “We were able to mow through the field, get into second place and pressure the Camaro. Both the Nissan and the Camaro had more straightaway speed. They got off the corners better, not because of tires but from a horsepower standpoint. Johnson finished just 0.552 seconds behind the Stevenson Motorsports Camaro and just 0.284 seconds ahead of the Doran Racing Nissan 370Z. Johnson described his late-race strategy. While the race ended well for Johnson, it didn’t start out as well for his co-driver Scott Maxwell, who started the race from the sixth position on the grid and fell to ninth after early race incidents. Maxwell ended up driving about half the race before handing over the driving duties to Johnson. “We had really no chance so it was like a perfect storm with that last yellow. We had a brand new set of tires and Billy Johnson who is the best here at Laguna,” said Maxwell. “With 30 minutes to go Billy had fresh tires and he went for it and just about pulled it off. It was a perfect strategy call by Multimatic and a great drive by Billy." Multimatic driver Billy Johnson was on a mission during the closing stages of the BMW Performance 200 as his #15 Boss302R had suffered an ECU malfunction with less than an hour remaining in the race, which although resolved by the driver cycling the main power on-track, left Johnson with no radio communication with his crew chief, Jeff Ripley, for a brief but extremely important few moments. A full-course caution was thrown just shy of the leaders final pit window but due to the lack of a radio Johnson missed the call to box the Mustang. Forced to stop two laps later, the Multimatic entry rejoined for the restart at the very back of the 56 car field having missed the GS class wave-by. But showing true Multimatic tenacity Johnson went to went to work, quickly slicing through the slower ST cars and beginning his attack of the GS pack within two laps. The #15 Mustang went from P15 to P8 in a matter of minutes, catching each successive car by nearly a second a lap. His teammate, Jade Buford in the #158 Mustang, let him through with twenty minutes remaining in the race and as the white flag was brought out he was up to P5 and three of the cars in front began to slow to conserve fuel. On the last lap the #15 was catching the P2-P4 cars rapidly as there was still fuel left in the tank courtesy of the slightly later pit stop. but it all ended a bit too early as everybody got to the checker and then promptly ran out of fuel on the cool-off lap while Johnson drove back to the pits. What could have been but for a few seconds. P5 for the #15 and P8 for the #158 which also ran out of fuel on the cool-off lap having stopped with the rest of the field during the final caution. Scott Maxwell started the #15 from the front row after securing pole position Thursday afternoon with a time of 1:56.520, this being the third consecutive Q1 for the team at Daytona and a phenomenal seventh time a Multimatic car has started from the pole position at the “World Centre of Racing”. Maxwell was in control of the race for the duration of his stint before handing the car off to Johnson during the team’s first stop, an hour into the two and half hour contest. Multimatic veteran, Canadian Motorsports Hall of Fame Inductee and two-time series Champion, Scott Maxwell will have a new co-driver for 2015 in the form of Billy Johnson, one of the winningest drivers in series history. 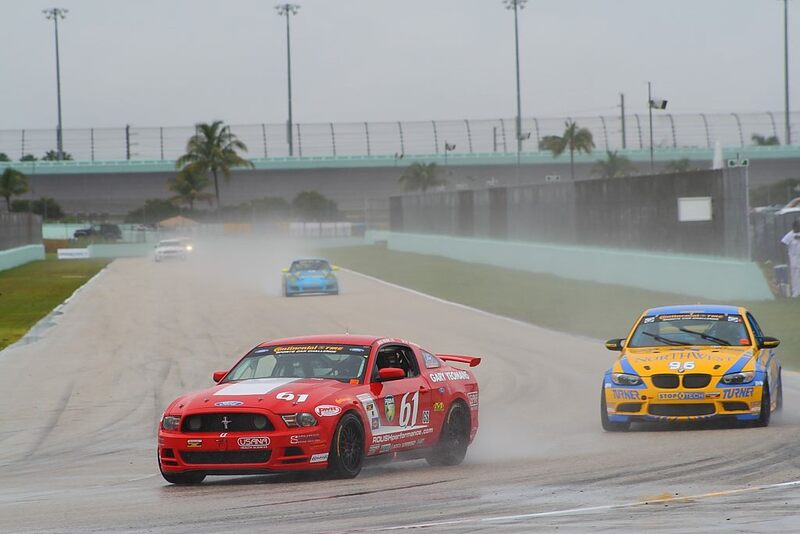 Every single win the Boss 302R has accumulated in CTSC competition has come at the hands of one of these two drivers. 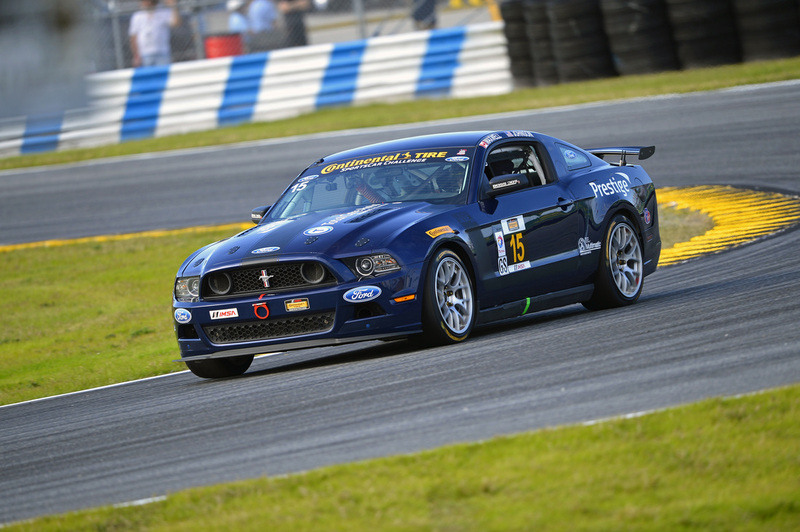 Johnson shared the #158 Multimatic Motorsports/Miller Racing Mustang with Ian James last season and the pair secured three podium finishes, the win at Road Atlanta and 7th in the Driver’s Points. Maxwell’s co-driver for the past two seasons, Jade Buford, is stepping up to a lead role this year in the #158 Mustang. Buford holds the record for the most CTSC pole positions in a season, capturing 6 of 11 in 2013, and is the only CTSC driver to secure pole twice in a row at the BMW Performance 200 at Daytona. Buford and Maxwell finished 4th in Driver’s Points in 2013 and 3rd in 2014. Buford will be joined in the #158 by Multimatic’s newest driver, the very young and incredibly quick Austin Cindric. At only 16 years old, Cindric already has an incredible resume that includes an X-Games medal in the Red Bull Global Rallycross Lites Series and ten top-ten finishes in USF2000 in 2014. He is also the youngest driver to ever podium in USF2000, the youngest driver to ever win an Historic Sportscar Racing Series race and later this year will become the youngest driver to ever compete in the legendary Bathurst 12-Hour, where he will pilot the Erebus Motorsports Mercedes SLS AMG GT3. At the ROAR Before The 24 Test at Daytona early in January the team definitely proved that they are ready for 2015 when Billy Johnson set the fastest lap of the test and an unofficial lap record with a time of 1:55.794, besting teammate Buford’s pole time from 2014. The pace continued into race week at Daytona as the #15 Multimatic Mustang set the fastest time in two of the three practice sessions. Maxwell went on to qualify the #15 on pole position Thursday afternoon, giving Multimatic a 3rd straight Daytona pole. Newcomer Cindric put the #158 an incredible P4, less than half a second off of Maxwell’s time. The BMW Performance 200 starts at 1:45 ET, January 23rd. Expectations are high, the team’s optimism is palpable and it looks as if 2015 is shaping up to be a banner year for Multimatic. Ending the 2014 Continental Tire SportsCar Challenge with a trip to victory circle at Road Atlanta, Billy Johnson is hoping to continue that momentum when the 2015 campaign kicks off in January at Daytona International Speedway. Johnson joined Ian James in winning the season finale in the No. 158 Multimatic Motorsports/Miller Racing Ford Mustang Boss 302R. The pair finished with eight top-10 finishes, placing seventh in the Grand Sport (GS) team standings. 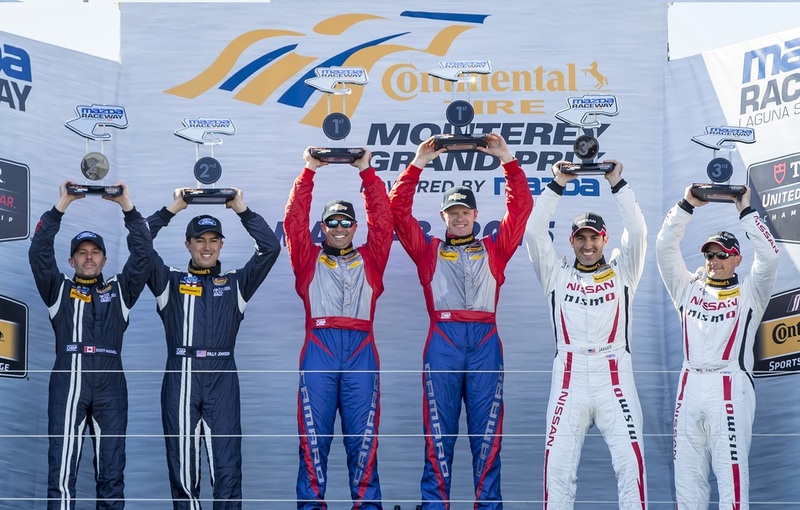 Road Atlanta was Johnson’s 16th career victory and 37th podium in Continental Tire Challenge competition. He joined the series in 2005 and had his best season in 2011 when he won three races and achieved the podium eight times co-driving a Ford Mustang with Jack Roush Jr., finishing second in the GS championship. Do you think you can carry over the momentum from the end of 2014, when you finished with a third at Austin and victory at Road Atlanta? When do you think you will have the newest Ford Mustang to replace the current Boss 302R? What kind of GS season should fans expect to see in 2015? 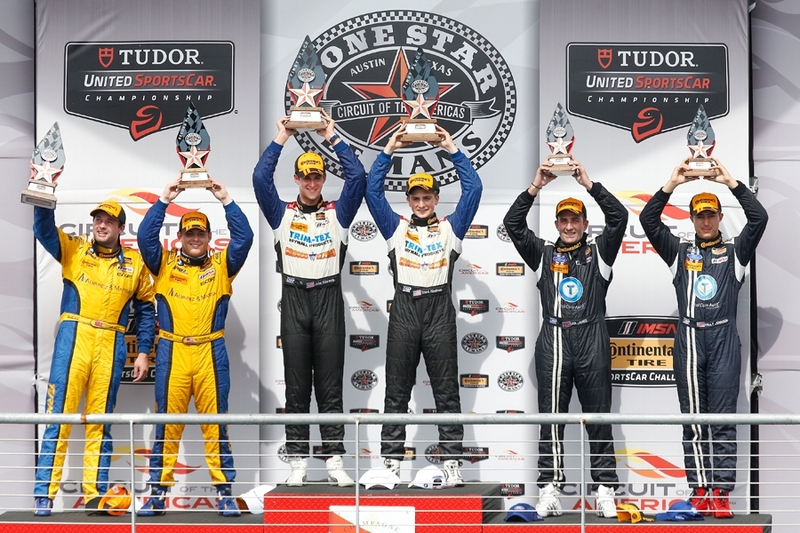 ﻿ATLANTA, Georgia (October 3rd, 2014) – The longest winless streak in Multimatic Motorsports’ 22 year history was finally snapped by Ian James and Billy Johnson at Road Atlanta with a victory in the final round of the 2014 Continental Tire SportsCar Challenge (CTSC). James qualified the #158 Multimatic Motorsports/Miller Racing Mustang a solid P6 with only two flying laps available before a red flag curtailed the session. He started the race conservatively on a damp but drying track and kept the car out of trouble and safely in the top five before handing over the spotless Boss302R to Johnson with an hour and a half remaining in the race. Johnson, who had won the 2013 season finale at Lime Rock Park and was motivated to repeat the achievement in 2014 didn’t waste any time getting to the front, passing the #6 Camaro for the lead with 25 laps to go. After briefly losing out to the Stevenson Chevy on a messy restart, Johnson made a spectacular outside pass at corner five with three wheels in the grass to retake the lead and ran the final 17 laps without challenge, winning by a margin of 2.186 seconds and taking the first checkered flag for Multimatic Motorsports in over three years. On top of this streak-busting win, Scott Maxwell, in the #15 Multimatic Mustang, set the fastest time by a wide margin in second practice, qualified Q2 a scant .040 seconds off the pole in the abbreviated session, took the lead in the first corner of the race, in damp conditions, and proceeded to dominate for the first hour before handing off to co-driver Jade Buford. Buford, who had the championship battle to worry about, kept the #15 in the top seven and out of harm’s way. With half an hour remaining, all challengers for third in the championship had suffered mechanical issues and Buford was given the green light to race. He brought the #15 home in P4, making a spectacular outside move down the hill on the last lap, and solidly secured third in the team championship with 273 points. 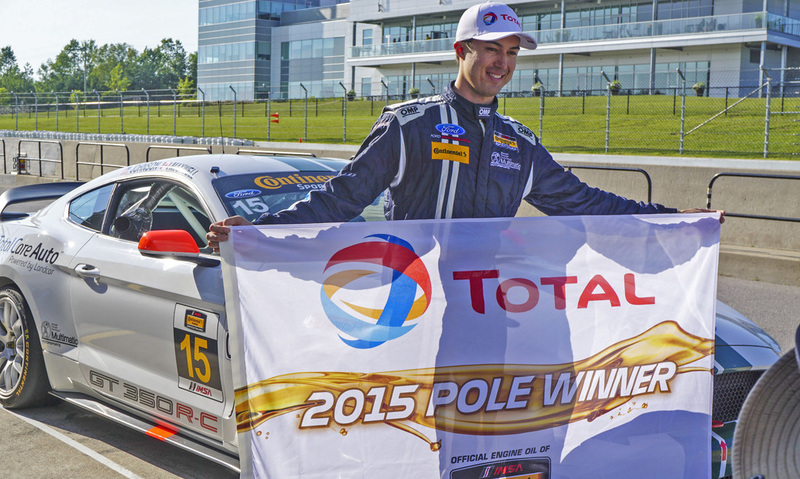 Maxwell and Buford earned nine top ten finishes, four top fives and one podium at Canadian Tire Motorsports Park (CTMP) during the 2014 CTSC. James and Johnson had a tough season of bumps, shunts, fires, wrecks and mechanical failures but the pair still managed to accumulate three podium finishes and end the season with a big win. Coming into the final two rounds of the championship the #158 was sitting outside of the top ten in points but with a third place at COTA and the 35 championship points secured at Atlanta the driving team managed to finish the season in seventh. Multimatic Motorsports’ efforts with the aging Boss 302R resulted in Ford finishing third in the Manufacturers championship, a scant two points behind Chevrolet who had the advantage of campaigning four of the highly touted new Camaro Z/28s. The team and manufacturer now look ahead to 2015 when they will campaign the new model Mustang which will more than level the playing field in the muscle car battle. When and where the new car will debut still remains a tightly held secret but expectations are high. 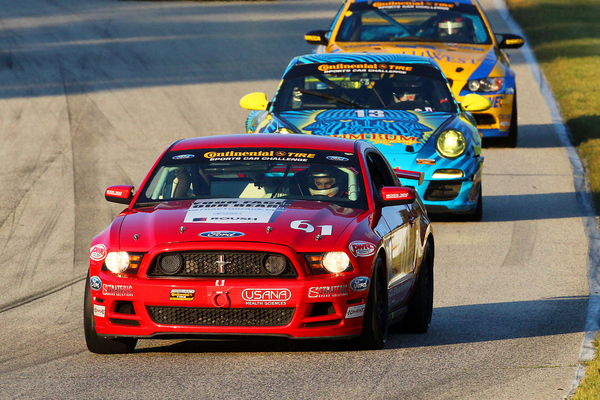 The Boss 302R, now in its final days of competition, has accumulated 9 wins and 22 podium finishes in the CTSC since 2010 (all of the wins can be attributed to either Billy Johnson or Scott Maxwell). Jade Buford scored pole position for the opening round of the season at Daytona driving the oldest car in the field. The ‘school-bus’ yellow #15 Boss 302R, chassis X1A, had been last run by Multimatic during the 2011 season spending time in museums and on test tracks since its last race. 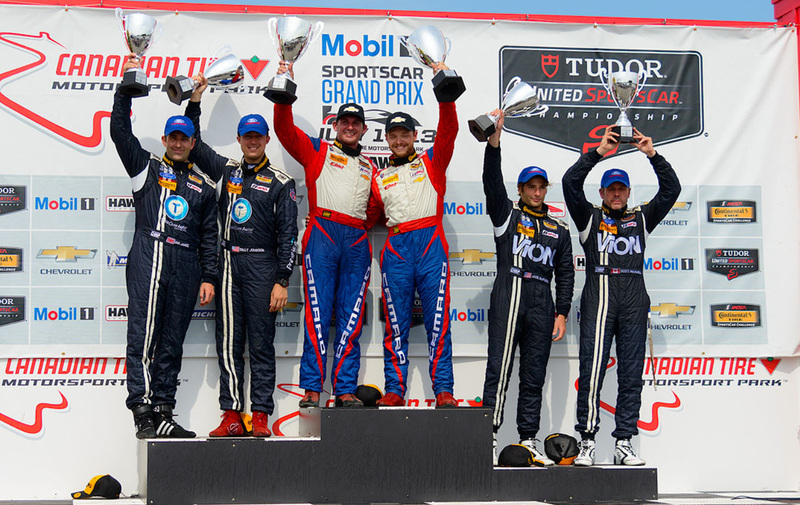 The Multimatic Motorsports crew secured a double podium at CTMP, the team’s home event. Billy Johnson and Scott Maxwell brought the #158 and #15 home second and third respectively for the team’s first podium finishes of the season. At COTA, the Multimatic Mustangs owned the front row in qualifying, with Johnson taking his first career CTSC pole and Maxwell setting the Q2 time. In a race that saw extremely variable weather conditions, Ian James managed to finesse the #158 past the #6 Camaro in the closing laps, on dry tires in extremely wet conditions, to claim a third place finish. Buford, driving the #15, was one of the few competitors to opt for rain tires, which resulted in a three or four second advantage per lap. Making up for an earlier fuel issue and a minor collision Buford carved through the field to finish P5. In the final event of the season James and Johnson scored Multimatic’s first win since 2011 and Maxwell and Buford claimed third in the championship with their P4 finish. AUSTIN, Texas (September 21, 2014) - In a nail-biting finish which saw the majority of the race under mixed rain/dry conditions, often with half of the track dry while the other half with heavy rain, the Johnson/James duo brought the No. 158 Ford Mustang BOSS 302R home in 3rd place. Johnson who has not had many qualifying opportunities in his 9 years in the IMSA series qualified the No. 158 Mustang on POLE for the first time in his career with teammate Scott Maxwell starting the race along side in 2nd. Johnson led the field for the first half of the exciting, mixed weather conditions race before turning the controls over to teammate Ian James. Ian charged through the field after the second pit stop of a conservative strategy which found himself on dry racing slicks with over half of the track covered in heavy rain. Ian made excellent passes in the closing laps of the race and brought the car home in 3rd place behind two cars who took huge gambles with their strategy. This marks the second podium finish of the season for the No. 158 Multimatic/Miller Ford Mustang. Competing in his 101st career Continental Tire SportsCar Challenge race, Billy Johnson came to Circuit of The Americas without having a TOTAL Pole Award on his otherwise impressive resume. He changed that in qualifying on Thursday, running a lap of two minutes, 22.504 seconds (85.892 mph) in the No. 158 Multimatic Motorsports/Miller Racing Ford Mustang Boss 302R to capture the Grand Sport (GS) pole for Friday’s race during the Lone Star Le Mans weekend. It will be an all-Ford front row for the event, which begins at 1:20 p.m. ET (streamed live on IMSA.com). Scott Maxwell was second-fastest in the No. 15 Multimatic Motorsports/Ford Racing Mustang Boss 302R co-driven by Ian James, running a lap of 2:23.000 (85.594 mph). Hugh Plumb qualified third in the No. 13 Rum Bum Racing Porsche 911 co-driven by his brother Matt Plumb, 2:23.211 (85.468 mph), and will be joined on the second row by Lawson Aschenbach, 2:23.307 (85.411 mph) in the No. 01 CKS Autosport Chevrolet Camaro Z/28.R co-driven by Eric Curran. Andrew Davis and Robin Liddell enter the race with a two-point lead in the GS standings over Trent Hindman, 263-261. Davis qualified fifth with a lap of 2:23.325 (85.411 mph) in the No. 6 Stevenson Motorsports Chevrolet Camaro Z/28.R, while Hindman qualified ninth, 2:23.651 (85.207 mph) in the No. 46 Trim-Tex/Cirroco Ozzimo BMW M3 co-driven by John Edwards. ﻿﻿BOWMANVILLE﻿, Ontario (July 12, 2014) – Courtesy of Ford Racing – In a spirited run that, emotionally speaking, very nearly erased an entire first-half season’s angst and frustration, Multimatic Motorsports drivers Ian James and Billy Johnson and their No. 158 Ford Mustang Boss 302R finished second Saturday to the No. 9 Chevrolet of Matt Bell and Andy Lally on the 2.459-mile, 10-turn track. In third was the second of Multimatic Motorsports’ two team cars, the No. 58 Ford Mustang Boss 302R piloted by Jade Buford and Scott Maxwell. Keeping in mind that racers often insist the best of almost any sports car race comes nearest its end, the last 14-minutes-or-so of Saturday’s Continental Tire Sportscar Championship race at Canadian Tire Motorsports Park certainly proved such to be the case. Only, those 14 minutes also were too few in number and way too late in coming for one of Ford’s best, driver Billy Johnson, who very nearly drove the wheels off of his Multimatic Motorsports’ No. 158 Ford Mustang Boss 302R, in an effort to work his magic all the way to the winner’s circle. Friday evening, James had expressed considerable optimism about Saturday’s race, saying that while CTMP now is likely “the most challenging track we go to,” Saturday’s ninth-place in CTSC qualifying led to the discovery of a CTMP secret that gave the team a still better feeling for Saturday. As if the top runners weren’t already nose-to-tail before a final caution period, the race’s fourth, with about 20-minutes remaining they were collected and constrained so that the final sprint to the flag wasn’t likely to see the tight racing dematerialize. Turned loosed by the green flag with 14-munites to go, the top-three running order was No. 9 Andy Lally; No. 15 Scott Maxwell; and, No. 158 Billy Johnson. Slowly and surely, Lally began pulling away from Maxwell, who behind had an anxious Johnson raring to go – if only Maxwell could. An accomplished racer in his own right – Maxwell in a couple of months’ time will be inducted into the Canadian Motorsports Hall of Fame – it’s just very, very hard for someone like Maxwell to quickly realize he or his car didn’t have what it’d take on Saturday to overcome the deficit built between Lally and himself. Like a shot from a canon, in an instant Johnson was by and on his way to challenge Lally. But it was really just too late. With roughly three laps available in those five minutes, there was little Johnson could do to overcome a nearly four-second deficit, even though the driver did close the gap to barely more than one second. “With those Camaros carrying two more liters in engine size than us (6.97 liters to 5 liters) it was tough to catch them, much less run with them,” Johnson said. Getting that ape to hang elsewhere wasn’t exactly easy. So difficult, in fact, the entire team would have to throw him off. And so it did: The pit crew was itself on fire, spending two fewer seconds (2:05) servicing the James/Johnson No. 158 Boss 302R than did the No. 9’s crew (2:07). The first half of the season has plagued the #158 Multimatic Motorsports / Miller Racing entry with some bad luck compounded by rules that left the entire Mustang field slightly behind the rest of the competitors. After a respectable Top-10 finish in the season-opener at Daytona, the James-Johnson duo were plagued with mechanical issues at Sebring, despite a top-3 qualifying, and Laguna Seca finishing 17th and 10th respectively before being taken out with a DNF at Lime Rock. Despite a couple penalties at Kansas, a top 10 finish was salvaged before a start of the race crash at Watkins Glen led to another DNF for the #158 Mustang. "I'm very happy to be apart of the Multimatic Team" said Johnson. "Everyone has been awesome to work with, Ian is a very talented co-driver, and Scott Maxwell and Jade Buford are two great teammates. We have a strong driver lineup, a strong team behind us, but we just haven't been able to shake this monkey off our backs to get the result that is representative of how hard this team is working. Despite all of this bad luck, the whole team has never been phased and they continue to work extremely hard to give us very good cars. For the second half of the season, hopefully our luck will turn around and we can get a few podiums and hopefully a win before the season is over." A last minute decision found Billy Johnson listed to drive the #64 Scuderia Corsa Ferrari 458 in the GTD class for the 24 Hours of Daytona. With a last minute call, Johnson was listed to drive the #64 with co-drivers Ken Wilden, Dave Empringham, John Farano, and Rod Randall. After the bare minimum of 3 laps under his belt at night, the minimum required to compete in the Daytona 24, Johnson was ready for the 24 having more seat time in practice than he had in the 2012 Daytona 24 where he was called to drive the #77 Doran DP during the race having never turning a lap in a DP. After starting from the rear, the #64 Scuderia Corsa Ferrari worked its way though the pack and led laps during the infamous "Twice around the clock" race and ran in the top 10 for a good part of the race. Johnson's stints happened in the dead of night where he turned consistent and fast laps. As mid-day Sunday rolled around, the #64 found its way to finish in the 14th position having turned every lap without going behind the wall. "It was great to be apart of the Scuderia Corsa Team" said Johnson, "The car was a blast to drive and I felt right at home as it had a lot of similarities to my Time Attack NSX. Having raced against Ken, Dave, John, and Rod for years, it was a fun race to work with them to be able to call them co-drivers". DAYTONA BEACH, Florida (January 24th, 2014) - Multimatic Motorsports returned to the Ford fold with a better than anticipated performance as both the #15 and #158 Boss 302Rs finished in the top 10 of the BMW Performance 200. The event marked the first race of the 2014 Continental Tire SportsCar Challenge (CTSC) and the first in the team's partnership with Miller Racing, which has been forged to return Mustang to its former glory in this highly competitive racing series. Practice saw the Multimatic Mustangs top five in every session despite the team having not run the cars for over two years and the lap times being well over a second faster than 2013. The team very quickly found a fast set-up for the infield but unfortunately the Balance of Performance (BoP) restrictor and ballast weight dictated by the series did not allow the Mustangs to match the top-end speed of the competition on the flat-out banking and straights of the oval. It was only the superior handling and braking performance of the Multimatic entries that kept them in the hunt. Qualifying was a somewhat bizarre affair as a red flag stopped the session after just a few minutes with only three cars setting times. Proceedings then restarted with only three and a half minutes remaining, just enough time for one flying lap. Once again, Multimatic's star qualifier Jade Buford proved that he has no equal when the pressure is on, and with everybody else still bringing their tires up to temp he put the #15 Boss 302R on pole, with a little help from a well considered draft out of the bus-stop. 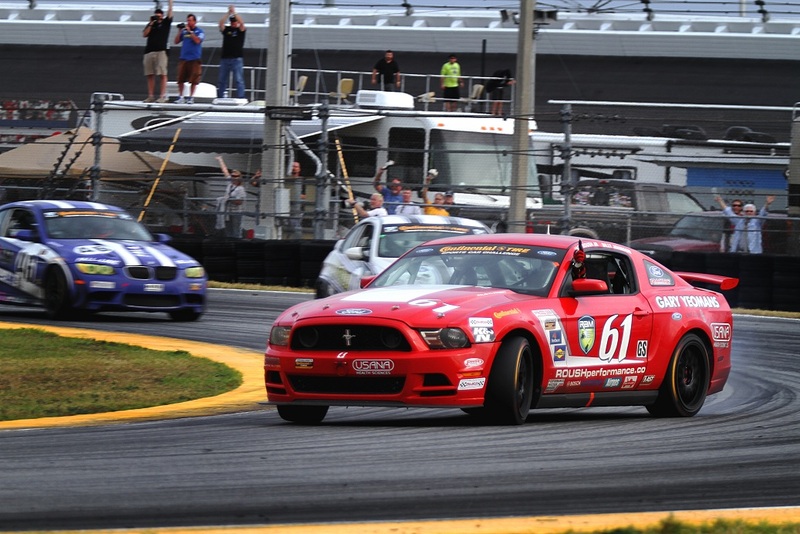 It was Buford's second consecutive Daytona CTSC pole and his seventh pole in the last 12 races, made even more impressive by the fact that he did it in the five year old, school-bus yellow Mustang campaigned by Multimatic back in 2010/11. The #158 unfortunately failed to qualify due to a power train issue and was forced to start at the back of field in P29. In typical CTSC fashion, the race was a crash-fest and a number of long yellows dramatically slowed the race pace and made pit strategy difficult. There were so many incidents that the 2014 Daytona event set a new record for the least laps completed at 54, with over half of those being under caution!! Despite being hobbled by the BoP restrictor, causing a severe power deficit to the BMWs and Porsches, both the #15 and #158 took turns leading the race and both cars remained continuously in contention for the lead. Before the final caution, which undermined the team's fuel strategy, Scott Maxwell in the #15 and Billy Johnson in the #158 were on a strong charge towards the front. At the checkered flag, the top six cars were all BMWs, all of which had run lap times almost two seconds faster than in 2013, with the #15 finishing P7 and the #158 P9. Hard work and tenacity in the two weeks between the "Roar" and the Daytona race ensured theMultimatic Mustangs would be up to speed. Practice saw both cars consistently setting top ten times despite a BoP disadvantage on the oval. The drivers and engineers quickly found a rhythm with one another and in Larry Holt's words, "It felt like everybody had been together for years rather than days." A red flag made qualifying a one lap shoot-out, which Jade Buford won with a lap time of 1:55.824, earning his 7th CTSC pole position and breaking the GS lap record which he set in 2013. Multimatic Motorsports Team Principal, Larry Holt, commented: "I was encouraged by how fast the guys got back on top of the Mustangs. We have had very little time with them since making the decision to return to Ford and proper preparation only occurred since the "Roar", but we qualified and ran well although ultimately didn't have the speed to win the race. The pace in Continental has really picked-up with the top race lap being over two seconds faster than last year, which is odd because there have been no significant rules changes in that time. Apparently we need to be taking another look at our approach to technical development, which is opportune as we are now building two new Boss 302Rs for the remainder of the season as the cars that we ran were both borrowed and a little long in the tooth. The tie-up with Miller Racing has turned out to be excellent and we have big plans for the future." Salt Lake City – Miller Racing, based in Salt Lake City, is happy to announce that it will be returning to the racetrack in 2014 with an exciting new program in partnership with Ford Racing’s official development partner, Multimatic Motorsports. The renowned Canadian-based Multimatic Motorsports operation and Miller Racing will field a two-car team of Ford Mustang Boss 302Rs in the International Motor Sports Association (IMSA) Continental Tire Sports Car Challenge (CTSCC). Miller Racing, which was established as a championship-caliber operation by the late Roger Miller in 2011, is now run by Roger’s wife, Cheri, and Ian James, Roger’s longtime co-driver. Multimatic Motorsports, based in Markham, Ontario, Canada, is the competition arm of Multimatic Engineering. Founded in 1992, the team has competed in the Firestone Firehawk Series, Motorola Cup, IMSA Sports Car Championship, Grand American Road Racing Association, American Le Mans Series, Grand-Am Cup, Rolex Sports Car Series, KONI Sports Car Challenge, Continental Sports Car Challenge and the 24 Hours of Le Mans. Multimatic Motorsports celebrated its 20th anniversary in 2012. The team has countless race wins and series championships in almost every major road racing series in North America, and is the only Canadian team to capture a class victory in the 24 Hours of Le Mans in 2000. Multimatic Engineering was called upon by Ford Racing to develop the Ford Focus Daytona Prototype in 2003, the Ford Mustang FR500C in 2008 and the Ford Mustang Boss 302R in 2010. The No. 158 Ford Mustang Boss 302R will be co-driven by Ian James and Billy Johnson, who is transferring from the Roush Racing team. The No. 15 team car will be co-driven by longtime Multimatic driver Scott Maxwell and Jade Buford. These four drivers have won a total of 31 CTSCC races over the past decade. The team is proud to announce that the team’s Mustangs will be supported by Total Care Automotive, Prestige Financial Services, ViON, Multimatic and Ford Racing. Total Care Auto (TCA) is a Utah-based company that provides finance and insurance products for automotive dealerships and provides training to dealership personnel. For over 30 years, TCA has helped auto dealerships in the western United States reach their finance and insurance goals. Prestige Financial Services, Inc. is a Utah-based premier provider of consumer financial solutions for both franchised and independent automobile dealerships across America. With a successful track record dating back to 1994, and a staff of best-in-class professionals, Prestige is recognized throughout the industry for its strong portfolio performance and innovative lending programs. The team’s first outing will be the “Roar Before the 24” three-day test at Daytona International Speedway on January 3-5, 2014, providing the team valuable practice prior to the season-opening race at Daytona on January 22-24. 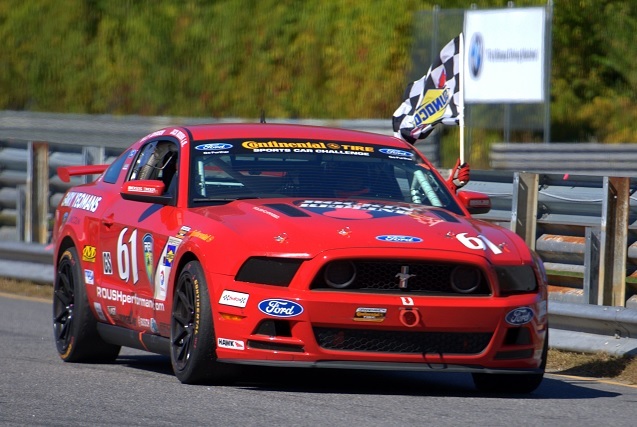 Johnson and Roush WIN season finale at Lime Rock! Jack Roush Jr. and Billy Johnson took the checkered flag first as the Grand-Am Continental GS race (and season) ended on Saturday, September 28 at Lime Rock Park, CT. 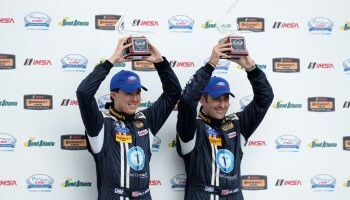 This victory marks the duo's 10th victory together and Johnson's 15th career Grand-Am win. The No. 61 Mustang’s sponsors include ROUSH Performance, Ford Racing, Gary Yeomans Ford Lincoln, Kooks Custom Headers, PWR, BMRS, GoPro, and Mechanix Wear. Amesbury, MA. 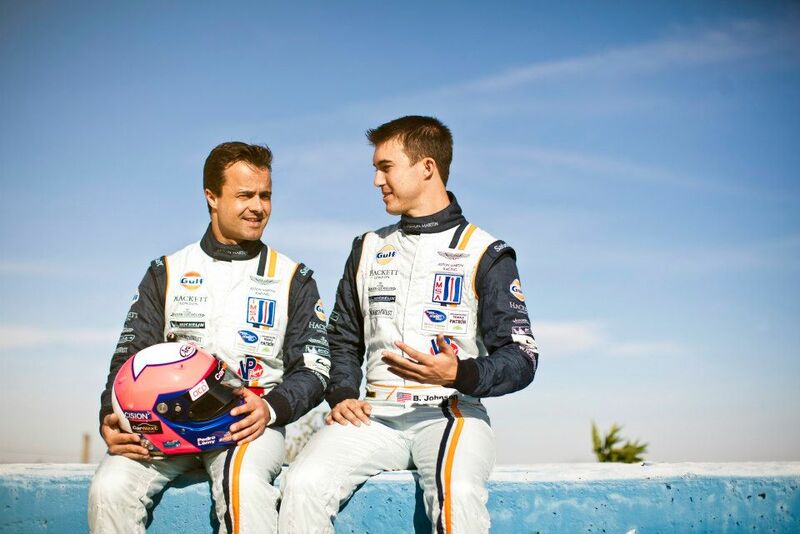 – September 8th, 2013 -- The increasingly successful duo of Michael Marsal and Billy Johnson captured their best ever Grand-Am Rolex Series race result this past weekend at Mazda Raceway Laguna Seca . Marsal and Johnson drove the No. 93 Turner Motorsports GT Class M3 to second place from an eleventh place start in Sunday’s two-and-three -quarter-hour Continental Tire Sports Car Festival race. This was Marsal’s second podium of the season, after narrowly missing what would have been a third at Kansas Speedway last month. Marsal started the No. 93 in 11th position and completed a clean 26 lap stint to work his way up to eighth place before pitting the car during a caution for a full service stop and driver change. Johnson was able to finish the remainder of the race with consistently fast lap times, driving the car to the front of the GT field. After multiple late race full course cautions, the No. 93 was able to conserve enough fuel to finish the race with only two pit stops. The duo completed 100 laps, finishing .940 seconds behind the No. 44 Porsche. "It was great to get the monkey off our back and finally get a podium with the TMS team and Michael after a few strong runs this year." said Johnson. "Michael did an awesome job and turned great laps which was crucial to the outcome when we had to serve a drive-through penalty". The 2013 Grand-Am season will be coming to a finale later this month at Turner Motorsport’s home track on September 28th. 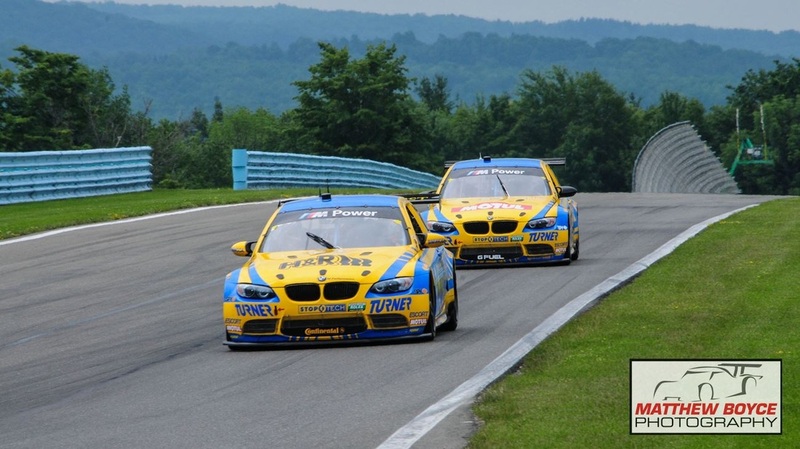 The blue and yellow BMWs will look to finish the season on a positive note at Lime Rock Park in Lakeville, CT. The race will be broadcast LIVE on Fox Sports 2 at 1:30pm on Saturday September 28th. Michael Marsal and Billy Johnson paired up in the No. 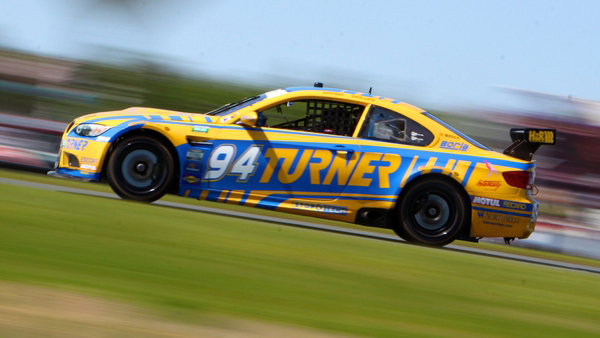 93 Turner Motorsports GT-Class M3 for the second time this season. Marsal completed a flawless forty five minute stint to hand the car over to Billy Johnson. With a little over thirty minutes remaining Johnson came in for a quick 17 second stop for two right side tires and fuel allowing him to jump to third. Johnson found his rhythm clicking off consistently fast laps in the No. 93 M3 to hold third until a right rear tire blowout on the banking, forcing Johnson to limp to pit lane with a little over 3 minutes remaining in the race. The late unexpected stop forfeited their top three position to finish ninth. The Continental Tire Sports Car Challenge race from Kansas Speedway will be televised August 25th at 3:00pm ET on Fox Sports 1. 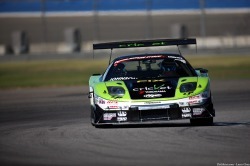 The next round of Grand-Am Road Racing comes from Mazda Raceway Laguna Seca on September 7th and 8th. The Rolex Race will be televised LIVE on Fox Sports 1 on September 8th at 5:00pm ET. Johnson and Roush Jr. Make it Back to the Podium for the 2nd time of 2013 at Indy. After a long season plagued with bad luck and an uphill battle with BOP adjustments, Jack Roush Jr. and Billy Johnson re-visit the podium with a 2nd place finish at Indianapolis Motor Speedway. Jack Roush Jr. put in a strong first stint and with some excellent pit stops and pit calls, the #61 was leading the field in the second half of the race. Johnson couldn't hold off a hard charging BMW and relenquished the lead to only be hot on the heels of the #46 BMW. After a few full-course cautions, Johnson ran out of time to capitalize off of any mistake and chance to regain the lead. "It's great to be back on the podium" said Johnson. "but this is Indianapolis and you always want to win here". Coming from a road-racing background with only 6 days under his belt in a car on an oval-track EVER, Billy Johnson finishes 15th in the Profit 200 NASCAR Nationwide Series race at New Hampshire Motor Speedway. 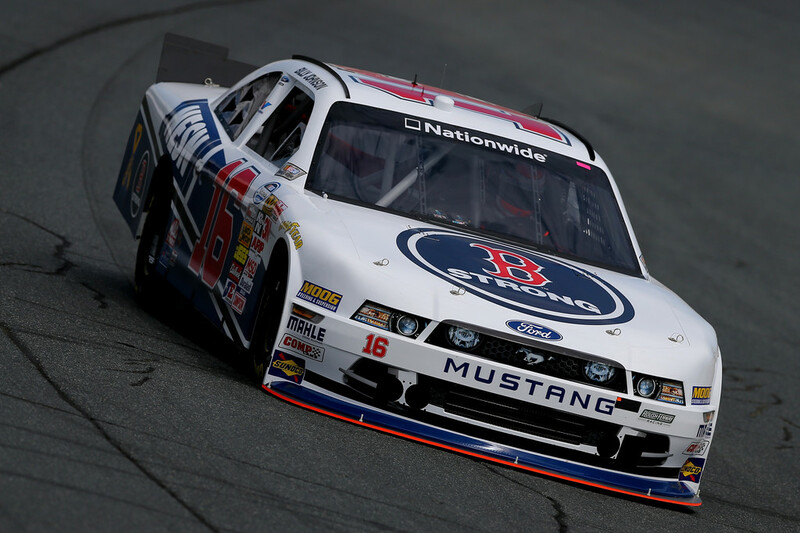 Billy qualified the Roush Fenway Racing No.16 Boston-Strong / NESN Ford Mustang in the 22nd position. "I wasn't very happy with my qualifying performance" said Johnson. "I under drove the car a bit and made a few mistakes. While I know we could have qualified in the top 15, I guess it wasn't terrible for my first oval outing". In a field of 40 cars including 6 NASCAR Sprint Cup drivers, Johnson had a daunting task ahead of him having never competed on an oval before. "Before the race our team felt like a realistic attainable goal for us was to finish on the lead lap in the top 15." said Johnson "We executed that goal and stayed on the lead lap the entire race. Being my first ever oval race and competing at this level, it was a successful result for us." After a successful test at Loudon a few weeks ago, Johnson returns to New Hampshire Motor Speedway this weekend for his oval debut in the NASCAR Nationwide Series driving the No. 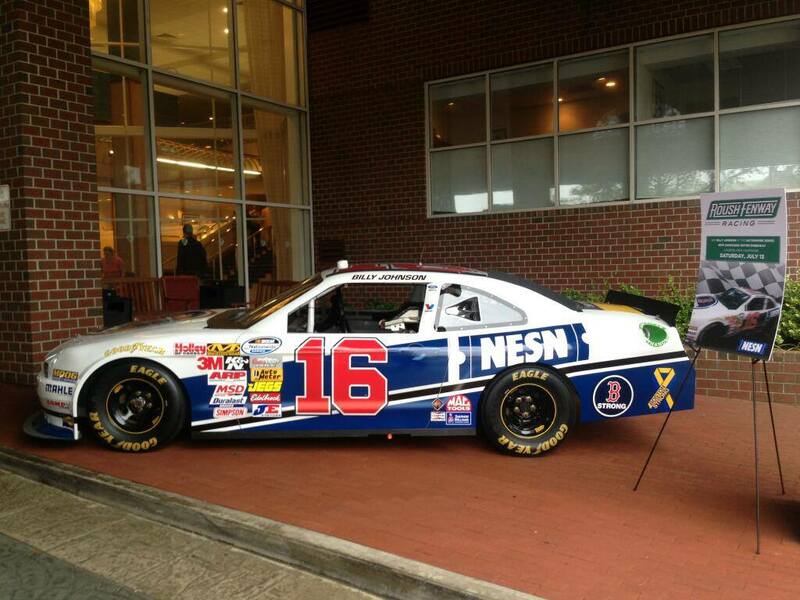 16 Roush Fenway Racing B-Strong/NESN Ford Mustang. 4th Place finish in the Sahlens 6-Hours of The Glen. Billy Johnson finishes 4th in the 6-Hours of Watkins Glen driving the No. 94 Turner Motorsports BMW M3 with Bill Auberlen and Paul Dalla Lana. After a long race with mixed conditions of dry and rain, Johnson finished out the final 2.5 hours of the race after taking over the controls from Bill Auberlen. Johnson was holding off a hard charging Andy Lally for the better part of 30 minutes until the last lap where a Ferrari who was a couple laps down pressed the issue into the bus-stop and forced Johnson off the road to ultimately give up the last step on the podium and finish 4th. 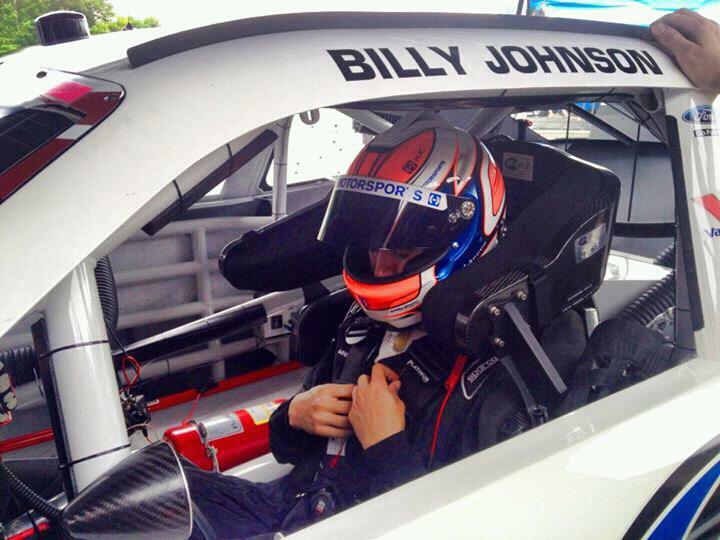 Billy Johnson Finishes 15th at Road America after leading 10 laps and charged through the field. Johnson finished 15th after a hard-fought up and down race which saw him leading 10 laps and passing the entire field to regain the lead after restarting last from a pit lane speeding penalty. Johnson started the #16 Ford EcoBoost Mustang in the 7th position and quickly found himself in 4th by Turn 3. After a couple laps Johnson passed for 2nd and later the #22 of AJ Allmendinger went off-track in Turn 6 as a hard-charging Johnson caught him and put a 15-car length lead over the 22. At the first pit stop, Johnson had a speeding infraction in pit-lane after being in the wrong gear. 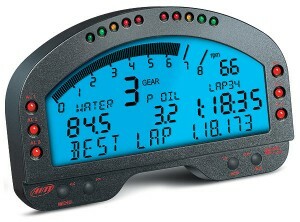 "Other than being in the wrong gear, my RPM was spot on for pit lane" said Johnson. This required Johnson to take the next green flag restart in last position. Within 10 laps, Johnson found himself in 2nd place after passing the entire field including an unfortunate accidental contact with the #33 of Max Papis. On the next restart, Johnson outbroke the #22 in Turn 3 who turned down on him and forced him onto the apex curbing resulting in contact. Johnson regained control and the lead and maintained the lead until the next restart where the #22 hit Johnson from behind in Turn 5, dropping him back to 4th. A few laps later, the #7 was hit from behind in the Turn 5 brake zone and collected the #16 of Johnson causing significant damage. This required Johnson to again start at the back of the pack for the last two green-white-checker restarts. Within those handful of laps, Johnson made his way all the way up to eventually finish the race in the 15th position. Billy Johnson Qualifies 7th in the #16 RFR EcoBoost Mustang. His Second fastest race lap put Johnson in the fastest qualifying group for Satruday's Qualifying. Starting behind Owen Kelly who was the fastest in Practice, Johnson was in a prime position to qualify the #16 EcoBoost Mustang. With rain approaching, Johnson headed out on track as rain started to hit the track. "There was quite a bit of rain on the windshield" said Johnson, "While I don't think it had much affect on the grip of the track, I was probably a bit too conservative on my qualifying lap. There's more speed in the car than this 7th place result so i'm looking forward to the race." Billy Johnson will be driving the EcoBoost No. 16 Roush Fenway Racing Ford Mustang in the NASCAR Nationwide race at Road America this Saturday, June 22nd. Making his NASCAR Nationwide Series Return since his last race at Montreal in 2012 where he challenged Jacques Villeneuve for the win before having to pit from P2 for fuel after the second Green-White-Checker (falling back to 20th to ultimately finish 8th), Billy Johnson is looking forward to getting back behind the wheel of a NNS car. "Montreal was a great race for us to challenge for the win and to finish in the top 10. I'm looking forward to carrying that momentum to Road America this weekend for an even better finish." Johnson posted the fastest time in practice in the 2011 NNS Road America race and went on to qualify 4th before retiring from the race from a mechanical failure. The race airs on ESPN this Saturday, June 22nd at 5pm EST. Aston Martin Racing will field a second Vantage GTE in next month's Sebring 12 Hours as a possible precursor to running a fifth car at the Le Mans 24 Hours. The second Aston at Sebring will be raced by Grand-Am regulars Paul Dalla Lana and Billy Johnson, who race in the main GT and Continental Tire-sponsored feeder series respectively. They will be joined in the car by Pedro Lamy, who raced for the AMR squad in 2004-05. 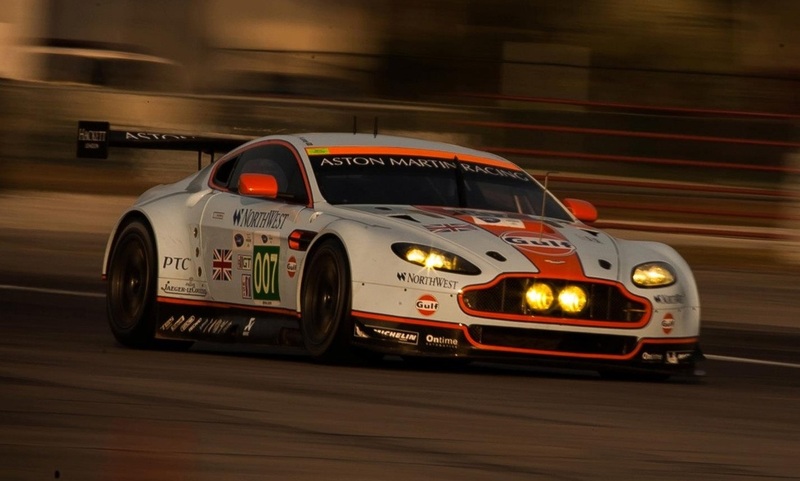 Lana and Johnson are likely to be part of a line-up in the fifth factory Aston at Le Mans should the car move up from its position at the head of the GTE reserve list. AMR team principal John Gaw said: "We want a North American car at Le Mans and we are hoping to hear some positive news on the entry situation in the next week. 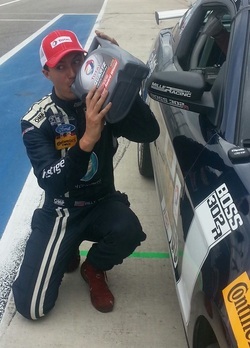 "Billy Johnson is one of the best young American GT drivers around, which is why he is in the car. 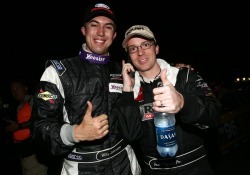 We've brought in Pedro to add some experience for Sebring." AMR's lead Vantage GTE will be raced by team regulars Darren Turner and Stefan Mucke and ex-Formula 1 driver Bruno Senna. Johnson & Roush Jr. WIN season-opener at Daytona! 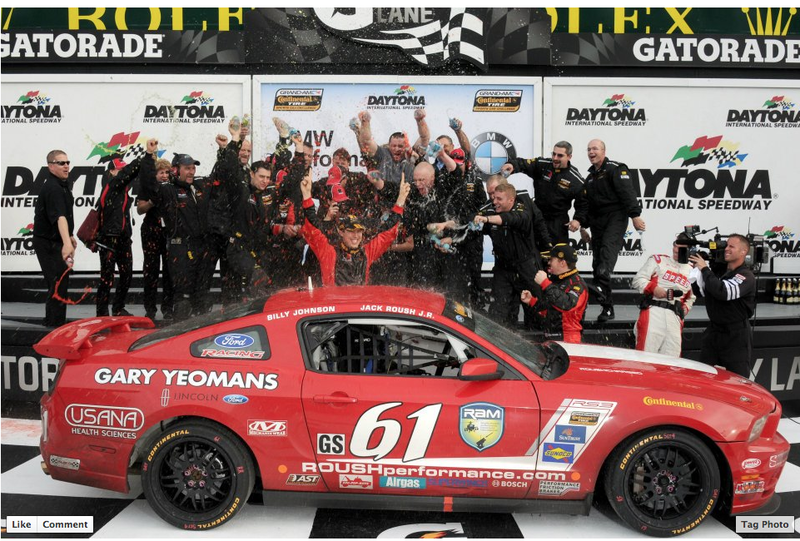 The Roush empire won again at Daytona International Speedway on Friday as Billy Johnson and Jack Roush Jr. scored a repeat Grand Sport (GS) class victory in the BMW Performance 200. Johnson led the final 70 minutes of the 2013 season-opening race in the No. 61 Roush Performance Mustang. He finished 1.812 seconds ahead of 2012 GS driver champion David Empringham in the No. 15 Multimatic Motorsports Aston Martin Vantage. Empringham, who co-drove with John Farano to the driver title last season, swapped the lead with Johnson just after the halfway mark, but a small bobble on the team’s final pit stop gave the Johnson/Roush pairing the cushion it needed. Roush drove from mid-pack early in the race when the Mustang suffered from a flat left-front tire. Between that and the back-and-forth tilt between Johnson and Empringham, it proved to be a dramatic day. Matt Plumb and Nick Longhi finished third in class in Rum Bum Racing’s Porsche 997. Plumb moved from seventh to third inside the final 30 minutes. The BMW Performance 200 will air at 4 p.m. ET, Feb. 2 on SPEED. The second round of the championship is March 2 at Circuit of The Americas in Austin, Texas. 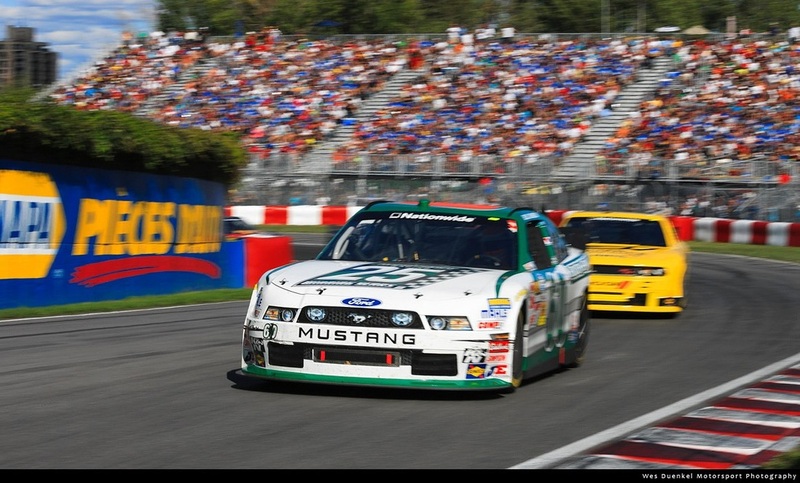 Montreal, Canada (Aug. 19, 2012) – With only two career NASCAR Nationwide starts under his belt, Roush Fenway’s Billy Johnson ran in the top-five for the majority of the NAPA Auto Parts 200 at Circuit Gilles Villeneuve; contending for the win late in the race. Fuel mileage came into play forcing Johnson to bring the No. 60 Roush Fenway "25 Winning Years" Ford Mustang to pit road after the second green-white-checkered flag attempt. On what would be the third and final green-white-checkered attempt in overtime, the young road racer restarted in the 20th position and in a mere two laps maneuvered his Ford to the eighth position to take the checkered flag. The rookie qualified the No. 60 Roush Fenway Ford in the ninth position for the scheduled 74-lap race. In a mere 11 laps, Johnson had moved his Ford up to the fourth position and continued to move through the pack. Following a 2-stop strategy plan, Crew chief Scott Graves coached Johnson to conserve fuel and brakes to have a car ready to fight at the end, and not to burn the car down trying to be the leader in the middle of the race. “It was hard to have to conserve fuel for the last 15 laps or so when I was in P2 because I knew I could run down Jaques; but it was unlikely for the track to stay green to the end” said Johnson. Sure enough 2 green-white-checker restarts ensued where Johnson held his 2nd place position both times. “We were almost out of fuel but were going to risk it until they added another yellow flag lap due to a hose clamp presumably on the track which was the final straw that broke the camel's back. It was heartbreaking to have to pull off the track from 2nd on that last restart when we had a car that I knew could win the race” said Johnson. The overtime forced the team to pit on lap 77 for a splash of fuel. Johnson lined up in the 20th position and worked his way through the field to finish eighth after the two lap sprint to the checkers. Johnson last drove in the NNS series in place for Carl Edwards at Road America in 2011 when Carl couldn't make it back from his Sprint Cup race in Sonoma. He also filled in to setup and qualify the #60 at Montreal in 2011 turning the car over to Carl who arrived just minutes before the start of the race. This will be Johnson's first NNS race at the famous F1 circuit. 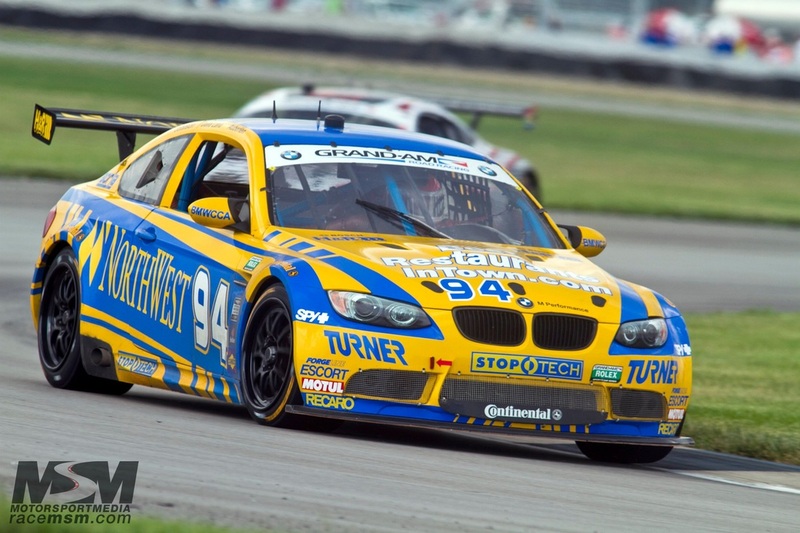 For the first time the Grand-Am Rolex & Continental Tire Series visits the famous Indianapolis Motor Speedway, Johnson driving with Bill Auberlen and Paul Dalla Lana in the #94 Turner Motorsports BMW M3 finish 4th in GT. Johnson assisted the TMS team to another top 5 in the final race of the 3-race North American Endurance Championship, where the team finished 2nd at Watkins Glen and DNF'd at Daytona. This marked the Turner Motorsport's 8th top-5 finish of the season and Johnson's 3rd top 5 (out of 3 races) driving for the team. Driving for the first time in the Rolex 6-Hours of the Glen, Billy Johnson makes his first Rolex Podium finishing 2nd in the #94 Turner Motorsports BMW M3 with Bill Auberlen and Paul Dalla Lana. "After driving for TMS in just a handful of races and finishing 4th twice, I'm excited to have finally reached the podium in GT" said Johnson. "Now that hurdle has passed, the next step is a win". For the Second year in a row, the duo come up just one position short of the win at Road America in the #61 Roush Performance, USANA Health Sciences, Gary Yeomans Ford/Lincoln Ford Mustang BOSS 302R. Jack Qualified the car in a solid 5th position and passed two cars going into turn 1 on the opening lap, which quickly turned into disaster when the #51 sister car of Jade Buford and Shelby Blackstock was turned around on the front straight and Buford wa found the wall before the start/finish line. After maintaining a solid top 5 position, Roush turned the controls over to Johnson. After a few laps of passing cars who did not pit, the #61 was back up front and leading the race. There was a total of seven cautions which found Johnson fending off a hard charging #13 RumBum Porsche and #96 Turner M3. On one of the restarts the #13 passed Johnson in a late-braking maneuver and held on for the win. "All of the yellow flags actually helped us a lot" said Johnson. "There was at least 3 restarts late in the race that only went on for 3-5 laps which allowed me to keep the tires and brakes cool to pressure the RumBum Porsche. If it wasn't for those yellows, our lap times would have fell drastically as our much heavier car would burn up the tires and front brakes. We just didn't have anything for that car in the brakes or down the straight." In a last-ditch effort, Johnson made an inside move in the last corner of the last lap but to no avail. This podium finish moves Roush & Johnson up to 4th in the Championship with only 4 more races to go this year. The race airs on SPEED Channel July 8th at 12:00pm NOON EST and again on July 9th at 8:00am EST. The ROUSH® Performance team leaves Mid-Ohio with both a win for the No. 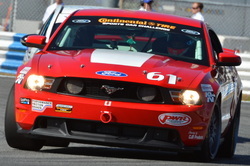 61 Mustang, driven by Jack Roush Jr. andBilly Johnson, and another top ten finish for the No. 51, driven by Shelby Blackstock and Jade Buford. Currently, the No. 61 is in 5th for the championship, and the No. 51 is in 9th. This makes for the 2nd win in 2012 by the No. 61 and the 3rd top by the No. 51. The race started with the No. 61 and No. 51 head-to-tail, with the No.61 qualifying 8th and the 51 10th. “There was some hard fighting for position early on in the race between myself and some BMWs, but I knew that the guys around me were all talented and experienced racers. As a result, I didn’t have to be overly worried about people wrecking me while we were battling. Unfortunately, not every race starts out with that same level of confidence in who you’re racing against, as we’ve seen earlier this year,” says Jack Roush Jr.
During the second half of the race, Billy Johnson was able to keep the No. 61 ahead of cars that had fresher tires and less concern for fuel conservation. It’s one thing to be able to drive fast, but to do so while having to save fuel and tires is on a whole other level of skill as a driver. The No. 51 also had a great run this past weekend. Shelby Blackstock started the race, and gained 3 positions before coming to the pits in 7th. Jade brought the car across the finish line in 9th, but only after overcoming significant adversity, with a pit lane incident, and stop-and-go penalty. The past weekend’s win has closed the championship points gap for the No. 61 from 35 points down to 17. “It won’t be easy to claim the championship this year, but honestly, it never is. You had better believe that we are going to fight with all that we have to climb back on top,” says Jack Roush Jr.
Special thanks to our Sponsors: ROUSH Performance, Gary Yeomans Ford Lincoln,USANA Health Sciences, Kooks Custom Headers, BMRS, Mechanix Wear, Strategic Brand Solutions, PWR, GoPro, and Performance Friction. Filling in for Bill Auberlen, Billy Johnson takes the #94 Turner Motorsports BMW M3 to a 4th place finish driving with Paul Dalla Lana. This race marks the 2nd time Billy Johnson was behind the wheel of a TMS M3 after a top-10 finish at Homestead Miami Speedway driving the #93. It’s been an interesting year so far for the ROUSH Performance road racing team. With a win at Daytona and a mechanical problem at Barber (resulting from another car going out of control), the team was eager to move on to Homestead for the third race of the season. We’ve historically performed well at Homestead, with a 1st place finish in 2010 and a 2nd in 2011. Practice leading up to the race went fairly well. With a lap time that put us as high as P2 in practice with a 1:26.217, the No. 61 ROUSH Mustang driven by Billy Johnson and Jack Roush Jr., looked fairly strong, as did the No. 51 Mustang, driven by Jade Buford and Shelby Blackstock. In qualifying, the No. 51 car lead the ROUSH team times and was third fastest in the field with a 1:26.296. Over the past few years, the ROUSH team has consistently been strong. In 2011, the No. 61 earned a podium in all but two races. In one of these two races, the team had an on-track incident at Daytona that ended the race, while in the other the No. 61 Mustang had a mechanical problem that put the car several laps down. The downside of doing well in racing is that there is a strong tendency of the series to places rules on you to slow you down. It appears that the Grand-Am rule package present at Homestead finally made it impossible to keep the team’s record of podiums going. Despite having balanced set-ups, a lack of incidents on-track, and great pit stops, the No. 61 Mustang scored a 5th, the 51 an 11th, and the 49 a 27th place finish. 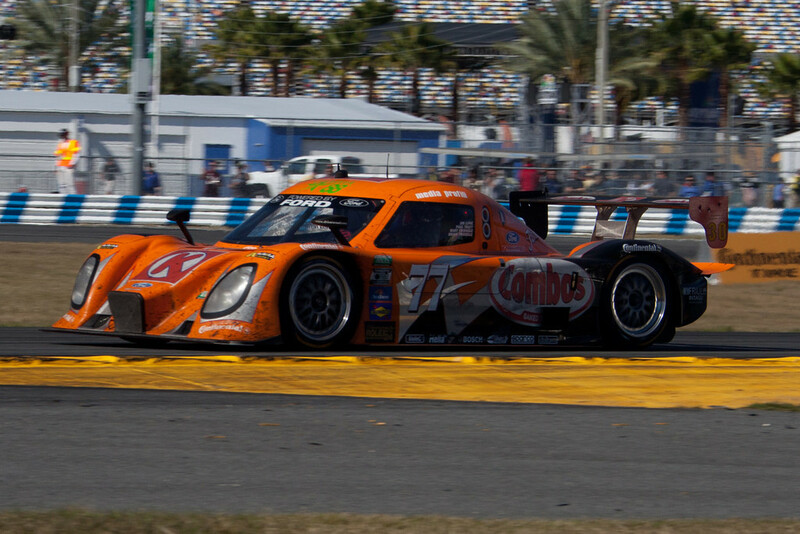 Billy Johnson makes his Daytona Prototype Debut during the 24 Hours of Daytona! Billy Johnson makes his Rolex Daytona Prototype Debut during the 50th Anniversary of the 24 Hours of Daytona driving the #77 Doran Racing Ford DP with Paul Tracy, Brian & Burt Frisselle, and Jim Lowe. Having never driven a DP before even in testing, Johnson was called in at the last minute to fill-in and drive the #77 DP for the first time during the race. Johnson started the race in the #94 Turner Motorsports BMW M3 with Bill Auberlen, Jorg Muller, Boris Said, and Paul Dalla Lana. Unfortunately the BMW suffered a mechanical issue and retired before the half-way mark in the race. Johnson found himself driving back home to North Carolina that night and stopped at a hotel about 45 minutes away. The next morning while having breakfast, Johnson recieved an urgent phone call needing him to fill in and drive the #77 Doran DP. 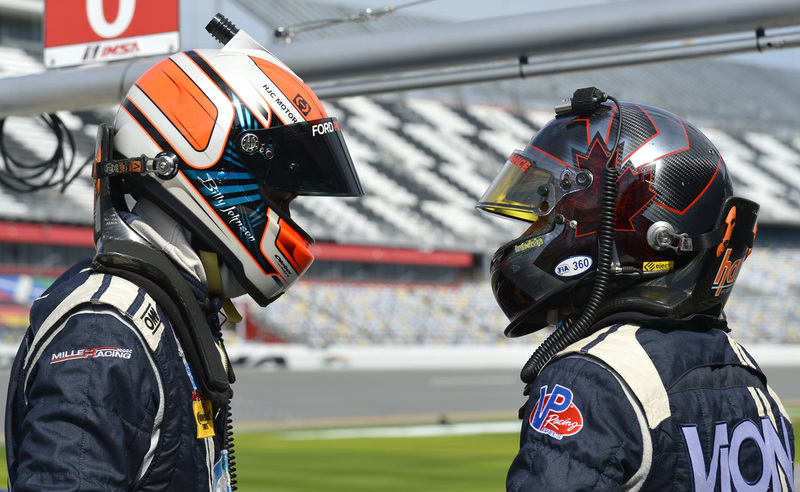 Within an hour of that phone call, Johnson was at the track in an orange Combos racing suit and found himself behind the wheel of a Daytona Prototype on pit lane during the race. Within 4 laps, Johnson was on pace and finished out a 2-hour double stint turning times within half a second of the cars best time of the race. "Everyone at Doran Racing were just the nicest people. They were very welcoming and helpful in getting me familiar with the controls of the DP since I have never even sat in a DP before." said Johnson. "The car was a complete blast to drive. I was having so much fun out there that it felt like I was in the car for less than 30 minutes. I would like to thank Kevin Doran and everyone at Doran Racing and Roush-Yates Engines for the opportunity to drive their awesome car." In part, Johnson helped the #77 DP to finish 7th over all in the race. Unofficially, Johnson was the only driver to turn laps in both GT and DP for the 50th Anniversary of the 24 Hours of Daytona. 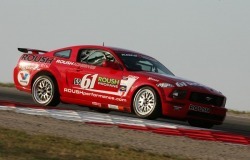 ROUSH Performance kicks off the 2012 Grand-Am CTSCC Season with a WIN! 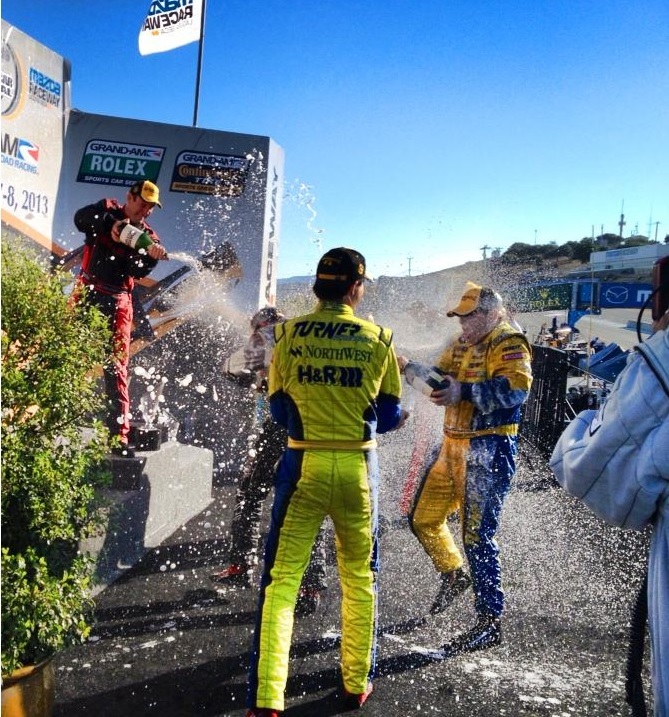 ROUSH Performance NASCAR-style podium celebration. Concord, NC. – February 2nd, 2012 - ROUSH Performance started the 2012 Grand-Am season in strong form fielding three cars, occupying the front row in qualifying, and having two cars finish in the top 10 in the Continental Tire Sports Car Challenge BMW Performance 200 on Friday, Jauary 27th at Daytona International Speedway. Rookie driver Shelby Blackstock sat the No. 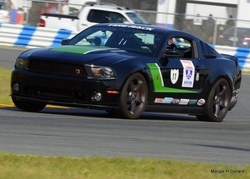 51 Starstruck/Vion Ford Mustang BOSS 302R on pole with a time of 1:57.6 beating teammate Jack Roush Jr. in the No. 61 Gary Yeomans/USANA Health Sciences Ford Mustang BOSS 302R clad in the 2013 Mustang GT bodywork by less than one-tenth of a second. This mark’s Blackstock’s first career pole in professional racing. The No. 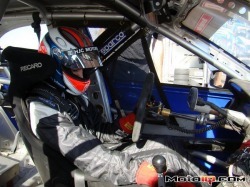 49 Micasa Ford qualified an impressive 10th place with Roly Falgueras behind the wheel. The green flag fell under wet conditions and with a field of anxious drivers who haven’t raced in months made for quite an exciting beginning to the season. Both Blackstock and Roush maintained a top six position keeping both cars out of harms way and raced hard into a drying track. With just under 30 minutes into the race, a yellow flag caution signaled the perfect time to switch from rain tires to dry slicks. All 3 cars came into the pits for fuel and a change of tires and were good for another hour of competition. With around an hour to go, all three cars pitted for the last time to change drivers and Billy Johnson, Jade Buford, and Brian Ortiz took over the controls for the 61, 51, and 49 respectively. Johnson made a hard charge to the front and took over the race lead on lap 41. Ortiz equally charged through the field to get the 49 into the top 10 before a last lap incident which crippled the car to limp home in a 30th place finish. Meanwhile Buford in the 51 made it through the last lap mess to finish in the 10th place in the No. 51 while Johnson and held off a gang of hard charging BMWs for the last 18 laps including two restarts for the first win of the series and first finish the Roush/Johnson Duo has had at Daytona in three years. “The car was very nice to drive and I look forward to coming back again in future races,” said Ortiz. The ROUSH Performance team is back at the shop preparing for Round two of the 2012 Grand-Am season which will be held at Barber Motorsports Park, in Birmingham, Alabama on March 30-31st. CONCORD, N.C. (Jan. 23, 2012) - The ROUSH Performance road racing team is proud to announce its plans for Daytona and the 2012 Grand-Am Continental Tire Series season. For the first time in its history, the team will field three cars in its stable at the BMW Performance 200 at Daytona International Speedway on Jan 27; The No. 61 Mustang driven by Billy Johnson (San Clemente, Calif.) and Jack Roush Jr. (Livonia, Mich.), the No. 51 Mustang driven by Shelby Blackstock (Nashville, Tenn.) and Jade Buford (Brentwood, Tenn.) and the No. 49 Mustang Driven by Roly Falgueras (Fajardo, Puerto Rico) and Bryan Ortiz (San Juan, Puerto Rico). The #61 ROUSH Mustang has had great in the series. In the last two years (since Miller Motorsports Park in 2009), Billy Johnson and Jack Roush Jr. have earned 6 wins, 14 podiums, and 17 top five finishes. 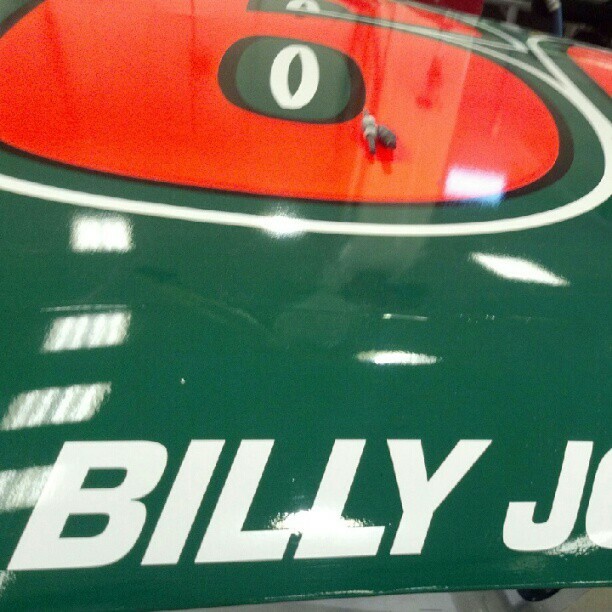 "I'm really looking forward to be back with Jack in the #61 Roush Performance Mustang this year sporting the brand new 2013 bodywork," says Billy Johnson. "Jack and I have had two amazing seasons in 2010 and 2011 finishing 3rd and 2nd in the Championship respectively and we look to continue the consistency and trend to finish 1st in the Championship this year in 2012." However, this is not the first time that the ROUSH Performance team has fielded a two-car effort. Last year, Blackstock and Falgueras competed against Roush and Johnson in the Continental Tire Series. "I am very excited to be driving the No. 51 Roush Performance Boss 302R with Jade, it is a huge opportunity and we are looking forward to a great season,” said Blackstock. “Last year was a great opportunity for me to be able to drive the Roush-prepared No. 51 Mustang with Roly Falgueras and we can’t wait to build on that in 2012. I want to thank Jack Roush Jr., Roush Performance and Ford for giving me this opportunity to be able to drive this amazing race car with a top team." Buford and Ortiz have yet to run in a race with ROUSH Performance, but they both have years of experience running in Grand-Am, and both tested with the team at Daytona earlier this month. "Shelby and I work very well together," said Buford. "This showed itself during the Daytona test earlier this month where our lap times were near the top of the charts. The new Boss 302R is an outstanding car to drive. We are looking forward to a great season." 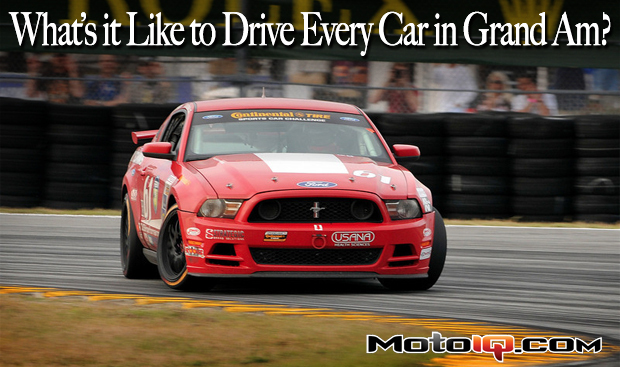 "For me it's an honor being able to drive with the ROUSH Performance team," said Ortiz. "I’ve driven against them many times in the past as part of the NASCAR Diversity Program. Now, thanks to Roly Falgueras, I will finally have the chance to drive with him. I watched Roly race as I was growing up in Puerto Rico. He is a smart driver with a lot of experience, and I'm sure that he will make a great teammate. I can't wait for the race at Daytona!" Buford and Blackstock will be driving the No. 51 Mustang for the entire 2012 season, while the list of races where the No. 49 Mustang will compete is still being determined. The No. 49 Mustang is sponsored by MicasaFord.com. The Continental Tire Series race takes place at 1:30pm (EST) on Friday, Jan. 27th. For more information on the event, please visit www.Grand-Am.com. Amesbury, Mass. 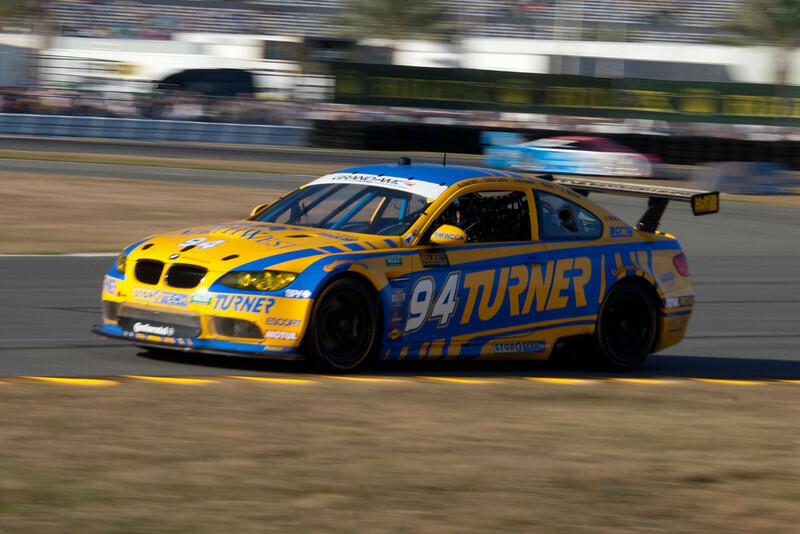 - December 15, 2011 - Will Turner announced today that Dirk Mueller, Joerg Mueller and Dirk Werner will drive for Turner Motorsport's 2012 Rolex 24 at Daytona effort. The three BMW Motorsport drivers will join Bill Auberlen, Billy Johnson, Paul Dalla Lana, Michael Marsal and Boris Said in two Prep 2 GT class BMW M3s for Turner's third run for a Rolex watch in the twice-around-the-clock endurance classic. "For the 50th Rolex 24 at Daytona I wanted to assemble the strongest BMW driver lineup I could," said Will Turner. 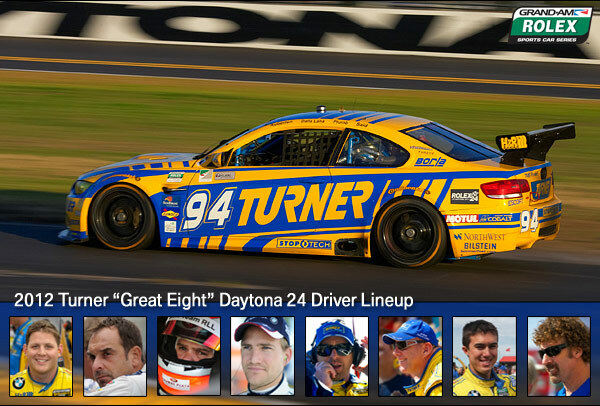 "I think the Turner Motorsport roster stands on its own as one of the strongest ever. I want to thank BMW Motorsport for their support and assistance. Last year we ran strong in the opening hours of the race before gearbox problems set us back. 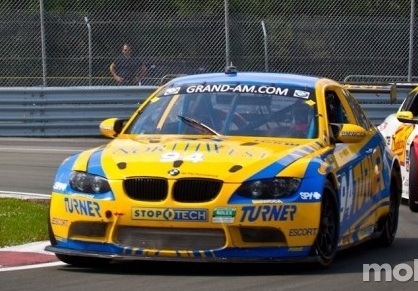 This year we return with two M3s on the back of a very successful 2011 Grand-Am season that included two GT victories. With luck we will add the team's biggest win to date." 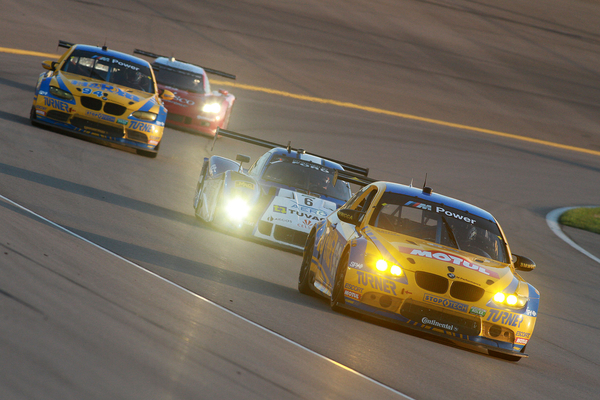 The Turner driver roster represents many of BMW's greatest 24-hour race victories worldwide. Synonymous with BMW racing for many years in the United States, Auberlen and Said co-drove a BMW M3 to the GT class win at the Rolex 24 in both 1997 and 1998. Said became the first American to win the 24 Hours of Nurburgring with his BMW Motorsport drive in 2005. One year earlier, Dirk Mueller, Joerg Mueller and the legendary Hans J. Stuck won the Nurburgring 24. Joerg Mueller was also part of the driving team that won the race in 2010. His first 24 hour win for BMW came at the Spa 24 in 1996. Dirk Werner has three 24 hour race victories in a BMW Z4 ; the Silverstone 24 in 2007 and the Dubai 24 in 2007 and 2008 driving a Z4 M Coupe. 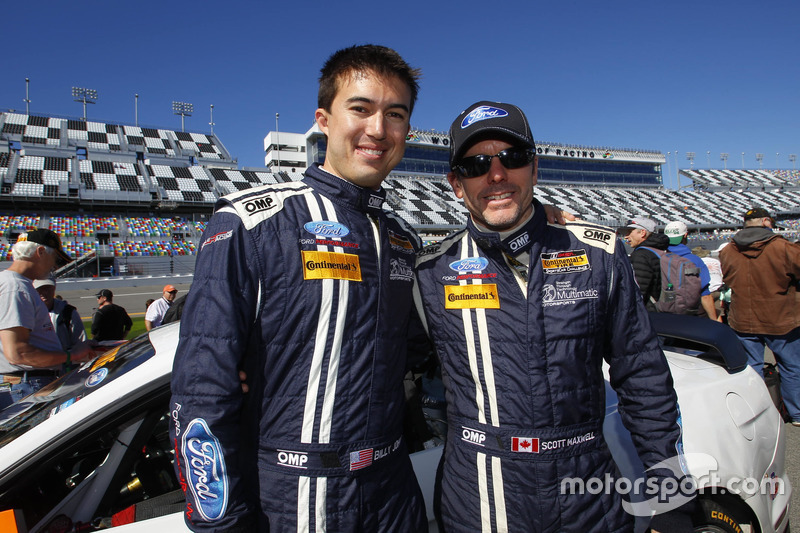 Dirk Mueller and Dirk Werner are also no strangers to Grand-Am competition. Werner won the GT driver's title for Porsche in both 2007 and 2009. Mueller has twice finished second in the Rolex 24 in 1998 and 1999, also driving for Porsche. Joerg Mueller has one previous start in the Rolex 24. Billy Johnson began his professional racing career as one of the first group of Formula BMW USA junior scholarship drivers in 2004. Johnson co-drove with Paul Dalla Lana in three GT races for Turner Motorsport last year with a best finish of fourth at Montreal. Paul Dalla Lana won the 2011 Continental Tire Sports Car Challenge Grand Sport driver's championship with Turner Motorsport. He also bested 235 BMW drivers to win the 2011 BMW Sports Trophy for the most successful privateer BMW driver in the world. Michael Marsal ran his second full CTSCC season with Turner last year and made two starts in the GT car. He finished second in GS points in 2010 with co-driver Joey Hand. The 50th Rolex 24 at Daytona will take the green flag at 3:30 p.m. ET on Saturday, January 28th. The race will be televised on SPEED television. 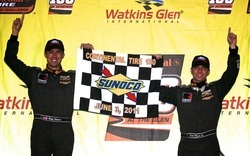 Johnson and Roush finish 2nd in the 2011 CTSCC Drivers Championship. 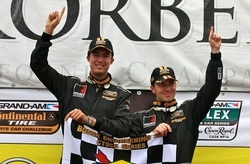 This season Jack Roush Jr. and Billy Johnson finished on the podium 8 times, with 3 wins. Out of the past two years, this pairing has earned 17 top five finishes, 14 podiums, and 6 wins out of 20 races and finished 3rd and now 2nd in the Drivers Championship. With 2012 on the horizon, they look to continue this consistency and finish on the top spot at the end of the 2012 season. In his second race with Paul Dalla Lana in the #94 Turner Motorsports BMW M3, Billy Johnson passes the race leader to get back on the lead lap to power his way through the field for a 4th place finish at Montreal. During this hard charge to the front, Johnson turns the fastest lap of the race with an average speed of 96.050mph. 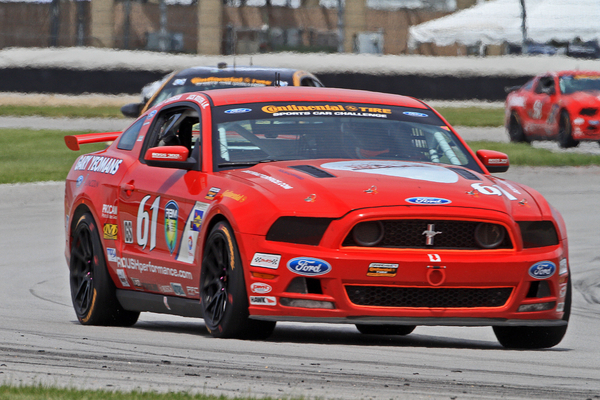 Jack Roush Jr. and Billy Johnson combined to score their third Grand Sport victory of the season in the No. 61 Roush Performance Ford Mustang Boss 302R. It was their second consecutive dominant victory at the 2.25-mile, 12-turn Thunderbolt Raceway. Roush started third and took the lead on Lap 15. He led 21 circuits before handing the car over to Johnson, who led the final 14 circuits. A year ago, they combined to lead all but four of the 87 laps. Due to prior ALMS commitments, Billy Johnson was asked to fill in for Bill Auberlen in the #94 Turner Motorsports BMW M3 in the Rolex GT class. Billy will be partnering up with Paul Dalla Lana who is currently 3rd in the Rolex Series points. ELKHART LAKE, Wis. (June 25, 2011) – Rookie Billy Johnson’s day was cut short after a mechanical issues on lap 26 in the Bucyrus 200 at Road America on Saturday afternoon. Johnson, who was subbing in for Carl Edwards, had an impressive qualifying lap which placed him in the fourth starting position. Johnson ran in the top five during the early stages of the race and looked to be a strong contender. Johnson, who had raced the 4.048-mile road course on Friday in the Continental Grand Am Series, had an unlucky spin off the course on lap 17, but did not cause any damage to the Fastenal Ford. After the spin, crew chief Mike Beam brought Johnson down pit road to get four new Goodyear tires. The caution flag was displayed on lap 21 due to a spin by Kevin Conway which allowed Johnson to catch up to the field. With the majority of the field coming to pit road for service, Johnson restarted the race in the eighth position. By lap 26, Johnson had worked his way up to the sixth position before experiencing a mechanical issue which sent him and the No. 60 Ford to the garage for the remainder of the race. Carl and the No. 60 team return to action next Friday at Daytona International Speedway. Race starts at 7:30 p.m. EST and will be televised live on ESPN. SONOMA, Calif.—After running a strong qualifying lap at Infineon Raceway, Carl Edwards told thePerformance Racing Network he has opted not to defend last year’s Nationwide Series win at Road America in Elkhart Lake, Wis., as he was scheduled to do. Rather than make the difficult commute, Edwards will remain in Sonoma and practice his Sprint Cupcar in preparation for Sunday’s Toyota/Save Mart 350 at Infineon. Edwards leads the Sprint Cup standings by 20 points over second-place Kevin Harvick. Billy Johnson will take Edwards’ place in the No. 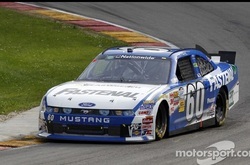 60 Roush Fenway Racing Ford at Road America. Johnson already was in Elkhart Lake to practice Edwards’ car while Edwards took care of his Cup duties in Sonoma. Edwards was 37th fastest in Friday’s Sprint Cup practice but improved dramatically in qualifying despite an early draw. He posted a lap at 92.076 at the 1.99-mile road course, and the time stood up until defending race winner Jimmie Johnson, the 18th driver to make a qualifying attempt, surpassed it. This will be the first Nationwide race without Edwards since June 12, 2005 at Nashville. Edwards had a conflict with the Sprint Cup race at Pocono running the same day, and he won that race. Edwards’ streak of 210 consecutive Nationwide races is the longest active streak in the series. 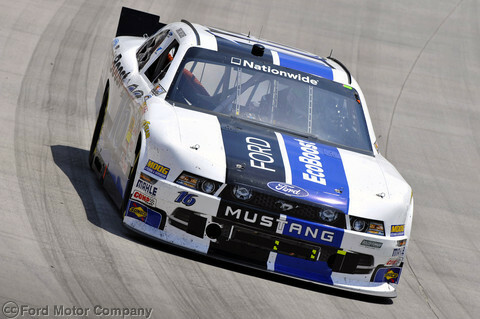 The change was made possible when Edwards’ Nationwide sponsor, Fastenal, agreed to the plan. “I think this shows you just how much our sponsors and our team are able to work together and change things on the fly,” Edwards said. “The original plan was for me to miss all of practice in our Sprint Cup car in Sonoma on Saturday, but literally as we finished practice today we found out that Billy Johnson was (tops in first practice in my car) at Road America. Driving the No. 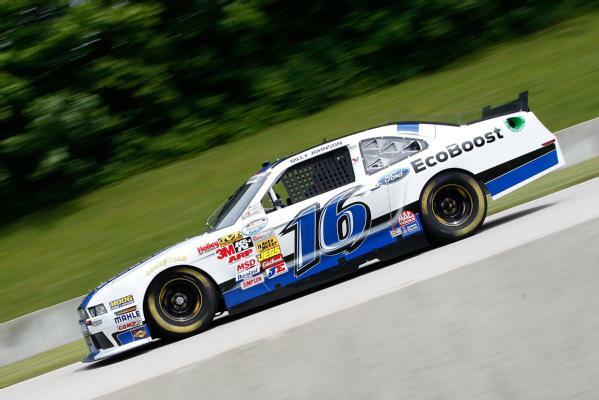 60 Fastenal Ford of driver Carl Edwards, Billy Johnson turned a fast road course speed of 108.050 mph to lead the first practice session of the NASCAR Nationwide Series Bucyrus 200 at Road America. Billy Johnson and Jack Roush Jr. 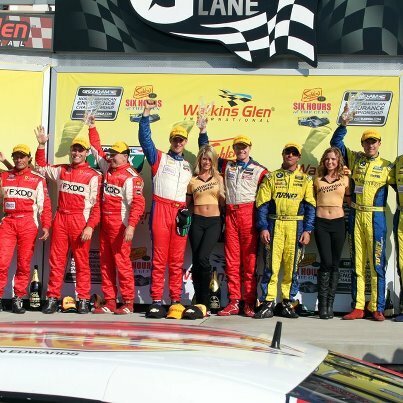 Celebrate 2nd Victory of the 2011 CTSCC Season at Watkins Glen. ROUSH Performance teammates Billy Johnson and Jack Roush Jr. led 30 laps, including the final 19 to bring home the win for the Continental Tire 150 at the historic Watkins Glen. This marked Round 6 of the 2011 CTSCC Championship. Billy and Jack drive the No. 61 Ford Mustang Boss 302R and currently have five consecutive podium finishes. Jack Roush Jr. took the green flag in the 4th position and stayed in the top 5 for the remainder of his stint before turning the controls over to Johnson. After a quick pit stop by the ROUSH Performance crew, Johnson found himself in the 6th position behind a few cars on a different pit strategy. After the green flag fell, the No. 61 quickly found its way into the lead of the race which it held for 9 laps. After the second set of pit stops cycled through, Johnson was in the lead again holding off a slew of BMWs. A hard charging John Edwards in a Camaro couldn’t get by the ROUSH Mustang on either of the late race restarts and Johnson held the top position all the way to the checkered. "Winning any race is a big deal, but it was especially the case for the 61 ROUSH Performance Mustang at Watkins Glen this past weekend. It was my first podium at the track, and the first in the GS class for my co-driver Billy Johnson, who had won there in the ST class back in 2007. The crew really deserved this victory. This was one of those weekends where nothing seems to go smoothly but the guys worked non-stop to fix the car and get it back up to speed." - Jack Roush Jr.
Catch the race on SPEED Channel, Sunday June 12th at 5:00pm EST. A 3rd place finish at Lime Rock Park finds Billy Johnson and Jack Roush Jr. in 4th place in the Drivers Championship at the half-way mark of the season. This consistency has put the ROUSH Performance team back in the hunt with 5 more races left in the Championship. In a hot Connecticut setting over Memorial Day Weekend, the No.61 ROUSH Performance team garner a 3rd place podium finish after a long, hot weekend. After no air-conditioning in the humid Connecticut summer for 3 nights, and a failed cool suit system mid-race, Johnson and Roush Jr. were as hot as the action on-track. Roush Jr. qualified the ROUSH Performance Ford BOSS 302R in the 4th position for the Memorial Day Classic. As the green-flag fell, Jack stayed in the Top 5 avoiding the many on-track incidents before turning the controls over to Johnson. Johnson returned to the track leading the race after all the pit stops have cycled through thanks to the quick stop from his team. With lapped traffic fighting tooth and nail to not be lapped, the field caught back up to Johnson. After passing a few lapped traffic, Johnson was punted off the road by an overzealous back-marker dropping him down to the third position. After the final pit sequence was finished, the No.61 found themselves in the wrong side of the Top 10 and battled their way back to 3rd where they remained as the checkered flag fell. This marks the duo's 4th consecutive podium finish. Round 6 of the CTSCC will be held at Watkins Glen - June 3rd. Billy Johnson & Jack Roush Jr. WIN Round 4 of the CTSCC at VIR! 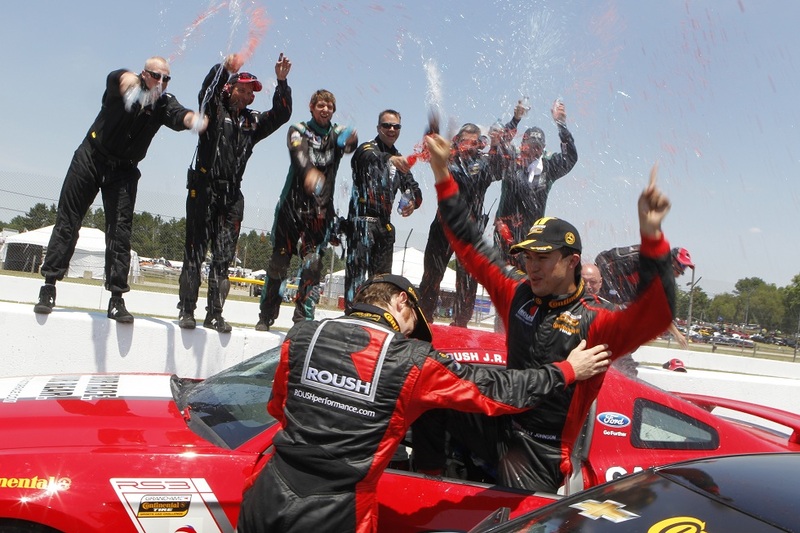 The Roush Performance team won Round 4 of the season at Virginia International Raceway. Drivers of the No. 61 Roush Performance Products Ford Mustang BOSS 302R, Jack Roush Jr. and Billy Johnson, started the BOSCH Engineering 200 from the 5th position, under the leadership of the team's new crew chief Jeff Campey. The green flag was dropped to begin the two and one half hour race featuring more than 60 Gran Sport (GS) and Street Tuner (ST) cars at the famed 3.27 mile Virginia International Raceway. Quickly making ground, Roush moved into the 4th position in turn one which he would hold for the remainder of his stint. Johnson returned to the track in ninth but over the course of the two pit stops found himself in the fourth position. Johnson quickly moved up to second place where a late race caution sealed meant it would be a 15 minute sprint race to the finish. On the restart Johnson passed the No.48 BMW on the outside of Turn 1 for the lead. Quick pressure from the No.96 BMW of Bill Auberlen remained for the remaining 15 minutes which saw the track get slick from a brief fall of rain. With 5 minutes to go, fender to fender, Auberlen passed Johnson on the outside of Turn 1. A few turns later with a good run through the famed VIR "esses", Johnson made a move going into the equally famous "Oak Tree Turn" which caught the No.96 off guard and ran wide leaving the door open for Johnson to regain the lead into the Oak Tree turn. This would seal the deal as Johnson held off a slew of BMWs to the checkered flag. "There must have been something in the air" said Johnson. "Everyone was out for blood and crashing into each other. The last 15 minutes was pretty exciting and the whole ROUSH Performance team did a great job giving me and Jack a great car to drive. Jack did a phenomenal stint himself staying up front and avoiding all the carnage while giving me a great car." 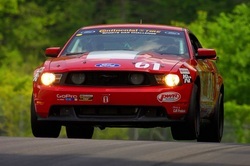 The CTSCC heads to Lime Rock for Round 5 May, 27th and 28th. What year is it? While I know it is 2011, the start of this year is looking very similar to the 2010 season. Last year we had a DNF at Daytona, victory at Homestead and a 2nd place finish at Barber. Reflecting on the first three races this year; we had a DNF at Daytona, 2nd place finish at Homestead, and a 3rd place finish at Barber. The game has changed with more teams capable of winning than last year, and the competition is much tougher. We are striving for even better consistency to dig ourselves out of this hole like we did last year, but this time with 8 more points to clinch the championship. If you are not familiar with our 2010 season, we finished 3rd in the Championship last year just 8 points out of the lead. This is the first year the ROUSH Performance team is campaigning the new Ford Racing BOSS 302R. With any new car there are going to be teething issues and sure enough we have been working through them in the first quarter of the year. Daytona has been pretty tough for the ROUSH Performance team the past two years. We had a fast car capable of winning and posted the fastest time of the weekend during practice. Despite Jack’s top 5 qualifying and working his way up to 3rd, all the stars aligned this year in a bad way with a lot of little factors that all came together at the same time resulting in Jack finding the wall on Lap 4 of the race and a DNF at the 2011 season-opener. We went back to the shop, fixed the car, and geared up for Homestead. Homestead-Miami Speedway was much better for us. It was just a year ago where Jack and I won at Homestead marking his father Jack Roush Sr.’s historic 400th victory in motorsports. Needless to say we really wanted to win this one especially me having won there the past two years. I was really trying to making it three in a row, but unfortunately this would not be so. Again we were a force to be reckoned while posting some of the fastest times of the weekend. Jack did a great job qualifying up front once again and keeping the car within the top 5 his whole stint and taking great care of the car. The #96 BMW pitted at a controversial time outside the mandatory 30 minute mark (In order to receive points, each driver must compete a minimum of 30 minutes). After all of the pit stops were completed, bounced them to a substantial lead. Unfortunately engine problems from a bad 02 sensor hurt the power of our No.61 Mustang and there just wasn’t enough to catch the BMW in a 2 lap sprint to the checkered flag after a late race full-course caution. The most recent race was last weekend at Barber Motorsports Park in Alabama. This track is one of Jack and my favorites due to the elevation changes, technical corners, and golf course quality grass and scenery. We had a very fast car this weekend, but it didn’t start out that way. Grand-Am added a restrictor to the BOSS 302Rs motor to reduce the power as well as mandated a different style limited-slip differential which greatly affected the handling of the car. We had to change every aspect of the cars setup to accommodate these changes. After much hard work from the whole team to figure out the new setup, I felt we had by far the best handling car there. During practice we again set the fastest lap time of the weekend. Jack qualified the car in 3rd and had his work cut out for him after getting passed in Turn 1 by the No.13 RumBum BMW. Jack was turning the fastest times of the race during his stint and had to fight through some very aggressive competition who were blocking on all of the straights. He was able to work his way back to 2nd before turning the controls over to me. Our pit crew did an awesome job with their best pit stop ever which bounced me into 1st place where I held until 75 minutes to go. Like Jack, during my stint I was turning the fastest laps of the race. With little hope to beat us outright, almost all of our competitors pitted under caution with 75 minutes to go. Keep in mind that most cars only have about an hour of fuel on board. This was a pretty big gamble but the only thing they could do to have a shot at beating us. About 20 minutes later, I pitted under green for the last time and ended up behind the entire GS field and most of the ST field. As the clock ran down, I was 15th with about 30 minutes to go. Within that time period (which also consisted of two more yellows –allowing all of our competitors to make it to the finish on fuel) I worked my way back to 4th and on the final lap with 1 turn to go, passed a BMW for 3rd place for yet another podium for the #61 ROUSH Performance Team. Everyone at ROUSH Performance have done an amazing job with this BOSS 302R but some little problems which we have now nailed down but more significantly big gambles our competitors been the difference between winning or not. We have been fast at every track we have been to and had two podiums in a row. The car has a ton of potential and is getting faster every weekend, I feel very confident in our team and am looking forward to our next race at Virginia International Raceway May 13-15th. The season has already been quite exciting and competitive with close finishes and a lot of teams capable of winning. Be sure to catch the race which will be aired on SPEED Channel the following weekend after every race, and stay tuned for future updates and blogs by myself and Jack. "ROUSH Stage 3 Mustangs Finding Success on the One Lap of America Event"
May 5th - The "One Lap of America" annual driving enthusiast event is a 9 day, 8 track, 3,500 mile vehicle endurance spectacle that kicked off April 29th and concludes June 4th. The ROUSH Performance Team entered two 2012 ROUSH Stage 3 vehicles, and the "One Lap" committee also chose a 2012 RS3 convertible to serve as the event's official media car, appearing in all ads and related media sites. Visit www.onelapofamerica.comfor more information. The ROUSH Performance Teams are currently on the move northward to Joliet, IL, expecting to arrive around 2 am Friday morning. A stellar performance today at the Barber Motorsports Park (Alabama) has moved the ROUSH Teams into 5th place and 12th place overall, and 1st place and 2nd place in our SSGT2 Big Bore class. Drivers Billy Johnson and our own Jack Roush, Jr., continue to push the 2012 ROUSH Stage 3's to their limits on the drag strip, road courses and auto-cross events. Other ROUSH Performance participants include Jay Velthoven, Andy Perry and Jaime Lyons. 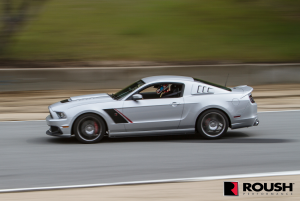 "The ROUSH Stage 3 cars are performing extremely well," says Jay Velthoven, Marketing Director, RPP. "The cars look great and perform even better. Many ROUSH fans have supported us at the track events along the way, posing for pictures and offering encouragement during this 3,500 mile endurance event. We're all exhausted, but we're also very excited by the success we're having with our ROUSH Stage 3 Mustangs." Over one hundred teams registered for the One Lap of America event. As of today, dozens and dozens of race teams have dropped out due to a variety of mechanical issues. ROUSH Performance general manager Gary Jurick adds, "Our 2012 ROUSH Stage 3's are ROUSHcharged to 540HP. They have our big 6-piston calipers, performance exhaust, and ride on ROUSH competition series suspension. Every performance upgrade on these RS3's is also available as an option when ordering your very own 2012 ROUSH Stage 3 from an authorized ROUSH Ford Dealer." Daytona Beach, Fla. — Swapping what one knows for something unknown has given stomach butterflies to many a soul—such being no different even for race car drivers. After competing for the same track space during the first four races, for the fifth race of the 2009 Grand-American Continental Tires sports Car Challenge season Billy Johnson traded his Motorsport Technology Group ride for a seat he’d share with Jack Roush Jr. over at the Horsepower Ranch. While some pondered and still others openly questioned the new driving mix, the debate was mooted when the pair combined for a thrilling, lead-swapping win in the 2009 season’s penultimate race at Miller Motorsports Park in Tooele, Utah. For the 2009 season, Roush for the first time broke into a top-5 championship points finish, while co-driver Johnson finished eighth, each certain still-better championship performances awaited. It didn’t take long for them to start making their point. In the 2010 season’s second race at Homestead-Miami speedway, Roush Jr. and Johnson combined to give Roush Fenway Racing head Jack Roush his 400th race win—after starting 34th in the field. Indeed, Roush Jr. had climbed through the field to take the race lead before handing the Mustang FR500C to Johnson to seal the win. And it wouldn’t be the only time Roush would lead a race in 2010. “In 2010, Jack led more laps, 139 total, than anyone else in the Continental Tire series,” Johnson said proudly of his teammate between tests sessions Friday at Daytona International Speedway’s annual Roar Before the 24. “One thing that’s helped me accelerate in my racing skills is the really great people, really great drivers I’ve worked with over time,” Roush Jr. said. It's now that time of year when all 2010 activities are finished and we are gearing up for a strong start for the 2011 season. After wrapping up a very successful tire test at Homestead-Miami Speedway two weeks ago, including trying out the new 2011 Ford Racing BOSS 302R racecar, there is still a lot that needs to be done between now and the Daytona Test Days that are coming up January 7. While in the previous installmentJack Roush Jr. has recapped the Grand-Am season, he did leave out a few events that happened this year that I will touch up on. But first, I will quickly say that this has been a great year for the whole ROUSH® Performance Team and I am very thankful to have been a part of such a great effort. Despite the DNF at Daytona, we finished in the Top 5 in every race (nine), with six Top 3 podium finishes and two wins. The first of those wins was at the second race of the year at Homestead and marked the milestone 400th victory in road racing and NASCAR for Jack Roush Sr. It was truly an honor to be a part of such an event and is the highlight of my driving career (so far). It's hard to ask for much more than that, but our third place in the championship really shows just how competitive the racing is in CTSCC and how you always have to bring the “A-game” to the racetrack. If you are up-to-date with all of the posts regarding ROUSH Performance Products No. 61 Mustang FR500C driven by Jack and myself (Billy Johnson) in the Grand-Am Continental Tire Sports Car Challenge, then I will do my best to keep from being too redundant. Jack has already expressed his feelings on the season and how important everyone on the team is and how racing truly is a team effort where every individual plays a crucial role in the outcome of the race. While I feel the same in every regard, I will tell you about some highlights of the year that he didn't mention. This was my first full season driving with Jack and RPP after driving with the team in a handful of races at the end of last year. At the first race of the year, held at Daytona, his dad gave both me and Jack the keys to brand new ROUSH 427R™ Mustang Convertibles for a media event that weekend. It was an awesome experience and that is such a cool car with a boat load of power, great sound from the exhaust, and tight handling. They were really fun to drive. But to make the story better, on the way back to the hotel we turned left onto a four-lane road which happened to be A1A at Daytona Beach. The irony of this was the radio started to play Vanilla Ice's famed song "Ice, Ice, Baby". Let me paint the picture a little better for you. I'm following Jack in matching 427R convertibles, turning left onto A1A (Beachfront Avenue), with the ragtop down (so my hair can blow), and while they weren't necessarily "5.0's" the spirit of us being in Mustangs, (and a supercharged 4.6L I might add) made it close enough to be an ironically hysterical moment. Just in case you were wondering, that is where the similarities with the song ended. Fast forward to around Halloween time, there was a two-hour indoor go-kart endurance race that Jack and I did together in Detroit. The competition was tight since most of the people there are regulars of that facility, including some of Jack's co-workers. We were also up against Jack's good friend Jude and my friend Shelby amongst teams filled with small, young go-kart racers who had a clear weight advantage on us. My National go-kart title didn't mean anything having to carry an additional 20-30 lbs around (and mind you I'm 6' 0" and weigh 160 lbs) which is HUGE in a sub-500 pound go-kart. That made me 25 percent heavier! You'll find most drivers tend to complain of a lack of power. I will be no different in saying our car did have a lack of power, but it did turn really well to the left. Unfortunately, we were running a clockwise track configuration which has a lot of right hand turns. While only qualifying third, I quickly put our kart up to first on the first lap. As the competition slowly got back up to speed I fell back to a rightful third place. But with good pit stops and pit strategy (hey, we do this professionally), we were able to just finish behind the go-kart kids for solid second place finish in was probably the fourth fastest kart. Now this was unacceptable. Sure we had a slow kart, but like at our Grand-Am races, we don't show up and race just to lose. So less than two months later, and a couple days before our Homestead tire test, I flew back up to Detroit to redeem ourselves in another two-hour go-kart race. While we had a slightly faster kart (maybe the third fastest this time) we still only managed to qualify third. This group was a little more rowdy with crashes that took out half the field on numerous occasions. Oh and did I mention Jack's dad was there timing us every second along the way, asking if we were gaining or losing to our competition, and giving input here and there. Whether it's a Cup race or our go-kart race, he doesn't mess around. And neither do we! With better pit stops, and me knocking down my average time from the previous race, we were able to pull off a win this time! It was far from easy and we had to give it 10/10ths because it was that close. We were now able to walk away pleased and start work down in Homestead preparing for 2011 in a new racecar. Ford Racing FR500C Mustang as well as a new hot-rod BOSS 302R (chassis #007) that we were doing some initial testing with. Our FR500C worked flawlessly and gave us a good benchmark of where we were at compared to the rest of the field, and also gave us a target to shoot for in the new car. With almost five years of development under its belt, the FR500C continued to show how good of a car it is and how we were able to achieve such great results this year. Speed and consistency are what it takes in racing, and that is what we have achieved with the FR500C Mustang. Now the BOSS has the new 5.0L RoadRunner engine in it which differs slightly from the base 2011's 5.0L Coyote engine. Though we found the new BOSS to be a very good racecar, it became clear during the test session that it needs to have a wing approved by the series for drivability, longevity, and safety. And that pretty much sums up our feelings for using the new car in 2011 – we will only consider running this car next season given a rear wing rule concession that we’re comfortable with. I would now like to take a moment to thank our great sponsors for all of their support this year. Not only do all of these companies have awesome products, they are also filled with great and helpful people who all had a big impact on our performance this year: ROUSH Performance, Diarkis, UPT, Engineering Directorate, Performance Friction Brakes, B.M.R.S., P.W.R., and Kooks. I also have to thank Jack Roush Sr. and Jr. for the opportunity to be part of such a great organization and Jr. for being an awesome co-driver and doing one heck of a job this year. Leading the most laps and finishing first in the Grand-Am Drivers Performance Index really says a lot about his driving abilities. It's now time for the Holidays but we are hard at work preparing for the upcoming Daytona Test Days on January 7. I hope you all have a great Holiday Season and tune to SPEED Channel next year to watch our races and follow our progress here at RoushPerformance.com. It's now been two months since the season-finale of the Grand-Am Continental Tire Sports Car Challenge at Miller Motorsports Park. Looking back, it's been a great year for the ROUSH Performance team that I'm personally very proud of. We got the most poles (with three), we won two races (including my father's 400th victory at Homestead), and we led more laps than any other team this year. On the downside, our Achilles heel in chasing the championship was the DNF at Daytona, the result of a mechanical failure. The Continental Tire Sports Car Challenge is simply too competitive to have any DNFs and still win the championship. To put into perspective just how close we came, we finished third this season in the points, just eight behind the champions. The two teams that finished ahead of us had zero DNFs this season. We have great team, and our performance can be seen at all of the races this past year, including Daytona prior to the mechanical problem. That one race became a season-long factor. As I always like to say, racing is a great sport where it's not just the drivers that you would recognize by name that are competing. The pit crews, crew chiefs, crews at the shops, and many more individuals each make critical contributions that can't be overlooked. In looking at our performance this past year, I'm humbled by the great accomplishments of our team. I also really have to hand it to my co-driver, Billy Johnson. He has great talent, which you can see at any race he goes to, and he's also great to work with. I've continued growing as a driver this past year to a large extent by working with Billy. If there's one moment that really sticks out as remarkable this past season, it's what happened at Homestead. As some of you might recall, we got the fastest time in qualifying and set a new track record for our series. However, during the standard post-qualifying inspection, Grand-Am made a judgement call claiming a part on our car was unapproved and sent us to the back of the field for the start of the race. This was a big disappointment at the moment given how strong we were. I was concerned that our opportunity to perform well here was now taken away. However, it ended up giving us the chance to really make history, not only winning the 400th Roush win, but doing so starting at the back of the field. Furthermore, it was the very first event ever for the ROUSH Road Crew so many of the club members were there to see this bit of history. People often ask me how it feels to have Jack Roush as my father. That always strikes me as an odd question -- I have never known anything else. However, what I will say is that the standards that have been laid out in front of me by my father, and what he has himself lived up to, are both inspiring and immense. So, to have been a part of the 400th Roush win was something that I'll always take great pride in. Racing at this level isn’t something that you can do without support, and we’re fortunate to have several great companies on our Ford Mustang. I'd like to thank our great sponsors for their support this year: ROUSH Performance, Diarkis, UPT, Performance Friction, B.M.R.S., P.W.R., and Kooks. Quite honestly, two months away from sports car racing feels like two years. I'm itching to get back in the car at the upcoming Homestead test (Nov. 30 - Dec. 1). In the off-season, I've taken the time to do some karting and spend some time on iRacing.com, especially to learn the Road America course. The Saturday after Thanksgiving, Billy Johnson will in Michigan so we can do a two hour enduro karting race at Kart2Kart. Stay tuned for the results on this race! The Roush Performance team finishes 2nd in Round 9 of the season at Trois Rivieres marking the 5th podium and 8th top five of the season. Drivers of the No. 61 Roush Performance Products Ford Mustang, Jack Roush Jr. and Billy Johnson, started the GP3R race from the second position and immediately took over the lead due to a crash in qualifying from the Pole-sitting Mustang Boss 302R. Jack dominated the first half of the race leading every lap and holding off many hard charging BMWs. A yellow flag caution came out 28 minutes into the race and a mid-race rule change allowed most of the field to pit and do a driver change despite the standard 30-minute rule to maintain driver points. When the green flag dropped again, Jack held his lead against many of the second drivers who were already in the car. About half way into the race, Jack pitted for a driver change and Billy Johnson took over the controls of the Roush Mustang. Making it back on track, Billy was in 6th place and had to fight his way through some tough company to get on the podium. As the 2-hour race went on and night fell, many cars were fighting braking problems and poor visibility of driving on a street circuit at night. Billy exercised patience and slowly picked cars off one by one passing the No. 83 Porsche of Cosmo and Dumoulin, the point leading No. 48 BMW of Espenlaub and Putnum, and the No. 45 BMW of Borcheller and Hendricks to find himself in the 2nd position. This intense 3-way battle allowed the No. 13 BMW M3 of Plumb and Longhi to maintain a comfortable lead. While reeling in the race leader, there simply was not enough time left in the race for the No. 61 Mustang to catch the BMW and contend for the win. The checkered flag fell with Johnson and Roush finishing 2nd in one of the most challenging circuits and conditions on the CTSCC schedule. With one round left in the Continental Tire Sports Car Championship, the championship is on the line with 4 teams mathematically eldgible to take home the big trophy. The series heads to Round 10, the 2010 Season Finale at Miller Motorsports park where Roush Performance will be looking for their third win of the season attempting to claim the championship. WATKINS GLEN, N.Y. (Aug. 7, 2010) – Road racing wiz Billy Johnson was impressive as soon as he got into the CitiFinancial Ford this weekend at Watkins Glen International. In his NASCAR Nationwide Series debut, the 23 year-old showed he had plenty of speed as he put the No. 6 in the top 15 in practice. When it was time to qualify, Johnson wheeled his Ford around the 2.45-mile track in 73.04 seconds; good for ninth on the starting grid. Once the race started the team used pit strategy early in the Zippo 200, but as Johnson tried to avoid a spinning car on lap 15 he received slight damage to the nose of his Ford and was forced to pit to fix his front end. On the restart, he was caught up in a multi-car wreck ending his debut early. Johnson finished 36th. From the drop of the green flag, crew chief Mike Kelley had a pit strategy plan and he started to execute it on lap 10. Kelley called Johnson to the pits for fuel only hoping it would allow him to make laps on a clean track. A handful of laps later, Johnson was trying to avoid a spinning car when he spun himself. The front end of Johnson’s CitiFinancial Ford received slight damage but the young driver was able to continue on. After pitting under the first caution on lap 21 for tires, fuel and to fix the damage to the nose of the No. 6 Ford, Johnson was scored in the 32nd position. On the lap 23 restart, the field was getting up to speed when a multi-car wreck on the exit of turn-one collected the young driver and ended his day with a 36th-place finish. Marco Ambrose led the most laps en route to taking the checkered flag in the Zippo 200 at Watkins Glen International on Saturday afternoon. The series now heads to the Irish Hills of Michigan for the Carfax 250 at Michigan International Speedway next Saturday, August 14, 2010. Billy Johnson will be driving the Roush Fenway Racing - Citi Financial # 6 Ford Fusion at the upcoming NASCAR Nationwide race at Watkins Glen - August 7th. The race will air LIVE on ESPN! 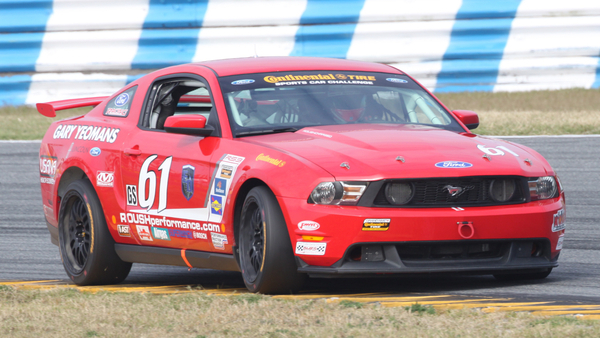 The Roush Performance team won Round 8 of the season at New Jersey Motorsports Park. Drivers of the No. 61 Roush Performance Products Ford Mustang, Jack Roush Jr. and Billy Johnson, started the Garden State 250 from the pole position on Saturday, July 17. This marked Jack's 4th pole in the 8 races thus far in the 2010 Season. Under the leadership of crew chief Quinn Conda the team continued to hold the lead for all but four laps of the 87-lap race. It was an exciting afternoon for the Roush Performance team as they claimed their second win of the year in the Grand Sport (GS) division. The green flag was dropped to begin the two and one half hour race featuring more than 70 Gran Sport (GS) and Street Tuner (ST) cars at the new 2.25-mile Thunderbolt Raceway course. Starting the race from the pole position, the Roush Performance team was eager make it to victory lane having never won a race they started from the pole at. Roush lead the first 44 laps which featured four out of five cautions in the race. While under the fourth caution, several GS cars pitted on lap 45, including Roush. During the stop, Conda made the call for Johnson to climb in and take the wheel for the second half of the race. Johnson returned to the track in second and was able to regain the lead after passing Joe Koenig on the inside of Turn 1 once the green flag dropped on lap 49. With 26 laps to go, Johnson was able to widen his lead to more than a second over Matt Plumb crossing the line in first when the checkered flag fell. This was only the seventh time this season the winning margin was under two seconds. Johnson will make his debut in the NASCAR Nationwide Series August 8, at Watkins Glen, N.Y. in Roush Fenway Racing’s No. 6 Ford Fusion. The Continental Tire Series will travel to Trois-Rivieres, Quebec August 13 where Roush Performance will be looking for their third win of the season. In April of 2010, Billy left his hometown of San Clemente, Ca and moved to the Mooresville/Charlotte, NC area to be closer to the Roush Race Team and to advance his driving career. Since then, Billy has been hired as an employee of Roush Fenway Racing to further his knowledge of the sport and to learn the INs and OUTs of one of the largest and most successful racing organizations in history. Billy Johnson and Jack Roush Jr. overcame a post-qualifying infraction and starting from the back of the field to overcome it all to win Round 2 of the Continental Tire Sports Car Challenge at Homestead/Miami Speedway. This was the duo’s second Grand Sport (GS) class victory together in the 2.5 hour, 91-lap Homestead 200 in the No. 61 ROUSH Performance Products Ford Mustang GT. This was Johnson’s second consecutive victory at the 2.3-mile, 11-turn road course, in a car that advanced 33 positions from start to finish. Jack Roush Jr. set a track record and earned his first career Pole Position on Friday only for it to be taken away after post-qualifying technical inspection for “improper brake ducts”. This didn’t demoralize Roush who had to start the race in 34th position. He passed 10 cars on the first lap and was up to 21st after two laps. He finally took the lead on Lap 35. After a great pit-stop by the Roush team, Johnson took over on Lap 39 in 13th position. He too worked through the field and was quickly in the top five and eventually into second as late as the final half hour. Chasing down the leader Matt Plumb, winner of the season’s opening race at Daytona, Johnson was cutting the 10-second gap by a second a lap. Under pressure from Johnson’s advance, Plumb’s No. 13 RumBum.com BMW M3 hit the rear of Eric Curran's No. 46 Fall-Line Motorsports BMW M3 in Turn 1, as Curran got bottled up behind slower traffic. The impact forced the hood of the No. 13 to come up, and Plumb in a precarious position, driving cautiously around the track with his windshield covered. Johnson passed Plumb while managing to hold Terry Borcheller at bay in the No. 45 Fall-Line Motorsports BMW M3 through the mess of slower ST and lapped traffic that caught Plumb off-guard. Plumb managed to make it to the final turn before hitting barrels filled with sand at the pit entrance. The sand and debris from the barrels forced the final of four caution periods. Johnson never looked back when the green flag flew on Lap 87, and charged to a 2.561-second victory. It marked Johnson's seventh series victory and third in the Grand Sport class..
"Jack did have quite a bit of fun today," said Johnson, who led twice for nine laps. "He did an amazing job in qualifying. He went through the entire field today, which is no easy feat with the caliber of drivers at this track. He handled it like a pro. He kept the fenders clean and just moved through everyone. He turned the car over in one piece for, gave us good track position and I took it from there. I had to work through a few people myself, but I was able to come out on top again." For Roush Jr., who celebrated with his father, Jack Roush Sr., in Victory Lane, it was a complete turnaround of emotions from close to 24 hours earlier. "It was real exciting race for us," Roush Jr. said. "I can't be more proud of my team and all the work they've done. It was a real privilege to be part of history with the Roush Racing group. I also have to hand it to my co-driver, Billy Johnson. He did an awesome job today. I'm looking forward to many more races." The win was also Roush Sr.'s 400th as a car owner. In nearly 40 years as an owner, Roush Sr. has also won in NASCAR's three National series, Trans-Am and IMSA. San Clemente, Ca. (Jan. 21, 2010) – Billy Johnson makes his return to Roush Racing and is back again with co-driver Jack Roush Jr. in the #61 ROUSH/DIARKIS Ford Mustang FR500C. After finishing the 2009 season with a strong three podiums - including one win - the duo is back together for an entire season and is aiming for the 2010 GRAND-AM Continental Tire Sports Car Challenge Championship. Over the past three years, Johnson has proved to be the most prolific and versatile driver in the Grand-Am Koni Challenge series. In this time frame, his unsurpassed 14 podiums and 6 wins were produced with six different co-drivers, four different teams, four different cars, and in two different classes. Johnson’s versatility is shown by his ability to jump in and win in front-engine front-wheel-drive Acuras, front-engine rear drive Mustangs, and rear engine rear drive Porsches; and his ability to give detailed feedback as a development driver. Johnson helped Roush Racing to their first GS team victory as well as piloted the first and only GS class BMW Z4 M-Coupe (built by Motorsport Technology Group and Larry Hahn) to its first podium in only its second race. Billy Johnson’s 2nd place in the drivers' championship with co-driver Karl Thomson and Compass360 Racing in 2007 was instrumental in bringing the manufacturers' championship to Acura in the ST class. His contributions with Jack Roush also helped secure the manufacturers' championship for Ford in 2009. "Fast Lap with Billy Johnson"
Billy Johnson and FX Motorsports Development Dominate the last few races of the 2009 Redline Time Attack Series and clinch the Unlimited RWD Championship. With an Overall Victory and Track record in Round 8 at AutoClub Speedway and in Round 7 at Spring Mountain Motorsports Park, Billy Johnson and FXMD clinch the 2009 Redline Time Attack Unlimited RWD Championship. With these two overall victories added to the teams previous three overall victories this season, FXMD was undefeated in all five RTA races entered in the 2009 season. Las Vegas, NV (Sunday November 15, 2009) FX Motorsports Development, Billy Johnson, and the Cricket/Yokohama Tire Unlimited NSX overcome disaster this weekend to take the Overall win at Auto Club Speedway and set another track record for a production-based car. Coming from an Unlimited RWD class victory and record at the 2009 Super Lap Battle Time Attack event at Buttonwillow the previous Wednesday, FXMD came to the Redline Season Finale at Auto Club Speedway with high hopes. With new untested changes made to the FX750 NSX before Buttonwillow, FXMD was looking to further shake down the car on Saturday in preparation for Sunday’s Time Attack. Saturday’s testing proved to be successful despite losing the right rear tire on the banking at 150mph. Driver Billy Johnson stated “I simply set the tire pressures too low for how cold the track conditions were and I didn’t let the tires get up to temp before the banking. It was not a tire failure by any means but rather a misjudgment in pressures. Thankfully I was able to keep the car off the wall and in one piece”. Unfortunately the down tire took out the canister of the KW 3-way motorsport dampers along with it. Thankfully KW North America was there and helped get the situation under control with a replacement. As Sunday rolled around, testing couldn’t have gone better with the new Performance Friction “Z-Rated” Forged Monoblock Calipers with multi-pad technology (1 brake pad per piston) and 2pc floating rotors. “These brakes are amazing” Johnson said, “The pedal remained rock-solid and consistent lap after lap with zero signs of fade. The combined stiffness of the caliper and multiple pads per caliper make modulating the brakes almost telepathic, you have to truly experience it yourself to believe brakes can be this responsive and communicative”. For the final run, the team installed a bone stock transmission that had a less than ideal gear ratio and final drive, and no limited slip differential. They increased spring rates and raised the ride height to prevent the right front tire from bottoming out into the fender on the banking. They re-aligned the car, put on new tires, upped the boost, and fixed a cracked header. With all these changes and no practice time, the team wasn’t sure what the result was going to be. As the sun started to set over the Southern California mountains, the last run group was the Unlimited class. With a best lap of 1:37.7 during testing, Billy had to shave off nearly 2 seconds to beat the current record set by the AMS EVO X which turned a 1:36.230 in the first timed session. On his second lap, Billy was able to edge AMS out with a record-setting lap of 1:36.103, just a tenth quicker than the EVO. This result marks the 5th Overall Victory and 5th Track Record for the team out of 5 races attended this year. An undefeated record clinched the 2009 Unlimited RWD Championship for the FX Motorsports Development team. We would like to thank Redline for a great year and special thanks to Sierra Sierra Enterprises for welding our header back together, they are a class-act. We would like to thank all of our sponsors for their superior track proven products and unwavering support throughout the entire year. Without their support this undefeated season would not have been possible. Special thanks to Sam Kwa from Yokohama Tire for providing us with valuable advice via phone throughout the entire weekend and Chris Marion from KW Automotive for the on-site product support. TOOELE, Utah (Sept. 18, 2009) - In a seesaw battle with the defending race winning driver and team Friday at Miller Motorsports Park, Billy Johnson passed Bill Auberlen for the final time in Turn 1 of Lap 46 - the final lap of the two-and-a-half hour Salt Lake City 200 (SPEED, 1:30 p.m. ET, Oct. 3) - and held off the 2008 winner by 1.095 seconds to earn his second Grand Sport (GS) victory of 2009 and the first ever for co-driver Jack Roush Jr.
Johnson, who joined the Horsepower Ranch team in June at Mid-Ohio Sports Car Course, regained the lead with an inside pass of Auberlen, kept Auberlen at bay for the first-ever win for Horsepower Ranch. 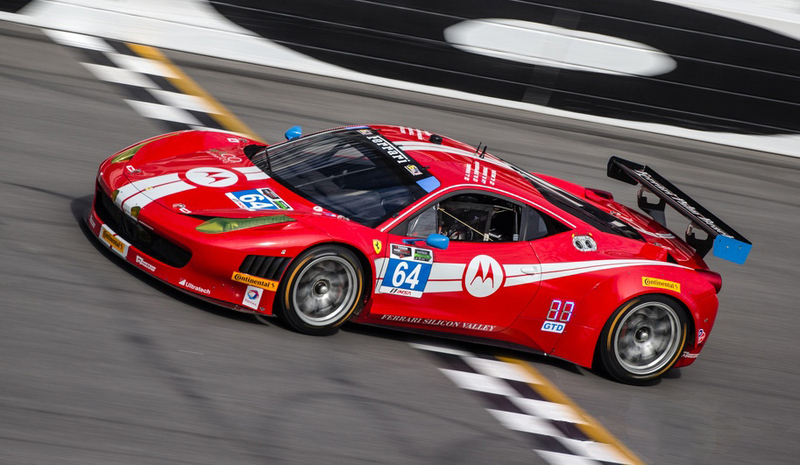 Johnson also won in March at Homestead-Miami Speedway, driving for Motorsport Technology Group. The race, which started under bright skies and in 80-degree temperatures, ended in near pitch-black conditions - albeit the 30-plus headlights navigating the 4.486-mile course and flashes of lightning south of the track. Johnson originally took the lead on Lap 31 from Dean Martin and led seven laps before Auberlen took the lead and held it at the line on Lap 38. Johnson put the No. 61 Valvoline/Roush Ford Mustang GT back out in front on Lap 39 on the front straightaway, and the two ran nose-to-tail for the next three circuits. On Lap 42, however, Auberlen slipped off the track momentarily, allowing Johnson to distance himself for about a lap. It didn't last long, however. Auberlen regained his composure and, on Lap 45, blasted past Johnson - who slipped off-line - for what he was hoping for his second consecutive victory and fourth straight for Turner Motorsport, which had won every GS race at Miller prior to Friday. But Johnson fought back, and drag-raced Auberlen all the way into Turn 1, where he took over the lead once again. Auberlen dogged him around the track, but couldn't get past, instead giving himself and co-driver Matt Bell a second-place finish in the No. 96 Turner Motorsport BMW M3. "The last few laps - how about the last 30 laps!" said Johnson, who has four ST victories to go along with his two GS wins this season. "I love racing in the dark. It's awesome to have that opportunity in the KONI Challenge. Definitely having Bill Auberlen in your mirrors is not the easiest thing, especially with the blinding lights. We went back and forth I don't know how many times. It was back and forth. Neither of us could see the road. It was a rough battle at the end - definitely good, hard racing. I was able to come out on top, and can't thank everyone at Roush enough." Added Roush after the car's third consecutive podium finish: "Man, I was sweating bullets. That was awesome. Billy did a great job. I can't be more proud of our No. 61 Roush Valvoline Mustang. I had plenty of battles during my turn, too. I was battling a little bit of a push. I knew that was going to happen, because the fuel tank was full. It was a blast out there. I rarely want to give the car up, but it was hot in there and I think I have a few blisters." Auberlen rejoined Bell after missing the team's last race, a victory in the Grand Prix de Trois-Rivières last month in Quebec. "He had the strength on the straights; I had the strength on the braking, but not enough to make up the difference," Auberlen said of Johnson. "He did a very good job and made no mistakes. One time I got by him and thought I had enough of a gap to get down the straight. To just get down the straight would be good, but he got by me. Oh, well. One time we rubbed, but I need my racing space, too. Matt did a great job - he did exactly what he's supposed to do. The guy's a front-runner every time. Turner Motorsport had won this race every year, so now, this defeat is horrible. But I guess second is okay - we'll take the points and keep on trucking." Bell moved past Martin into third in the GS standings by one point, while point leader and fifth-place co-finisher Ken Wilden lost two points over James Gue and Bret Seafuse, who earned fourth. Wilden and Seafuse battled for the majority of the opening 22 laps, with Wilden taking the lead on the first lap, and Seafuse moving to second by Lap 6. The pair pitted within a lap of each other, with Martin holding onto the lead after Wilden brought the No. 59 Rehagen Racing Ford Mustang GT into the pits on Lap 25. The only caution period came out on Lap 27 for debris in Turn 6, and the green flag flew to resume action on Lap 31, the same lap Johnson passed Martin, who had held a 10-plus second lead at the time. Wilden now has 292 points, while Gue and Seafuse, in the No. 37 Trumansburg ShurSave Ford Mustang GT, have 274 points. A 14th-place finish in the Bosch Engineering Octoberfest Oct. 4 at Virginia International Raceway, regardless of what Gue and Seafuse do, will sew up Wilden's first Grand-Am championship. Bell also has a mathematical shot at the title, but he is still 29 points behind Wilden. Gaining six positions in the final laps was third-place finisher Joey Hand, the co-winner the 2007 GS race, in the No. 97 Turner Motorsport BMW M3 he shared with Chris Gleason, despite a second pit stop. The pair came from 17th. Earlier in the afternoon, Dan DiLeo earned the pole position with a time of 3:09.544 (85.202 mph) in the No. 77 Maxwell Paper Products Co. Porsche 997. It was first career pole, and he and co-driver Bryan Sellers went on to finish 10th. Billy Johnson and Jack Roush Jr. finish 2nd at Trois Rivieres, Quebec in the No. 61 Valvoline / Roush Racing Ford Mustang FR500C in the Grand-Am Koni Challenge Series. FX Motorsports Development, Billy Johnson, and the Cricket/Yokohama Tire Unlimited NSX set a track record for a production car at Carolina Motorsports Park and claim the overall title in Round 5 of the Redline Time Attack. Kershaw, SC (Sunday, August 10th, 2009) -The FX Motorsports Development NSX with driver Billy Johnson set a new record for a production based vehicle at Carolina Motorsports Park. The final time came in at 1:30.630 substantially besting the previous record. The time was good enough to capture the overall championship for the Redline Time Attack series. 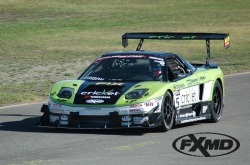 In addition to the Time Attack victory the FXMD team was also able to win the 1st super session of the season further strengthening their position for an overall season championship. Billy Johnson said "The effort this team puts into the car is apparent. From the struggles the team had in the 2008 season their hard work and persistence is reflected in the reliability and speed of the car this year. While huge leaps have been made in the development of the car, there is still much more potential in the car that we have just started unlocking." With this win FXMD is in a strong position for the overall championship and now hold five track records Laguna Seca, Long Beach Grand Prix, Buttonwillow Raceway, Willow Springs International Raceway, and Carolina Motorsports Park. We would like to thank all of our sponsors for their superior track proven products and unwavering support. Special thanks to Sam Kwa from Yokohama tire for providing us with valuable advice throughout the entire weekend. FX Motorsports Development, Billy Johnson, and Yokohama Tire set the track record at Willow Springs International Raceway for a production car and claim the overall title in Round 2 of the Redline Time Attack Series. Las Vegas, NV (June 2, 2009) - On Sunday May 31st at Willow Springs International Speedway, the FX Motorsports Development/Cricket Wireless NSX with driver Billy Johnson captured the overall victory in Round 2 of the Redline Time Attack Series. With a final time of 1:18.555, substantially besting the previous record of 1:22.22, the team set a new track record for a production based vehicle at the “Fastest Road in the West”. In addition to the Time Attack victory the FXMD team was also able to win the 1st three-lap wheel to wheel “Super Session” of the season further strengthening their position for an overall season championship. “The guys at FX Motorsports Development have done an amazing job with this car. After overcoming one of the biggest hurdles of the NSX platform, the car is the fastest and most reliable it has ever been” said Johnson. “Winning the 3 lap "Super Session" is a true testament to the team's abilities fielding one of the most reliable cars out there. We have a great group of people and companies working with us and couldn't have done it without their support." With this win FXMD is in a strong position for the overall championship and now hold four track records: Laguna Seca, Long Beach Grand Prix, Buttonwillow Raceway, and now Willow Springs International Raceway. We would like to thank all of our sponsors for their superior track proven products and unwavering support. Special thanks to Sam Kwa and Paul Algarin from Yokohama tire and Chris Marion from KW Suspensions, for providing us the track side knowledge and advice throughout the entire weekend.